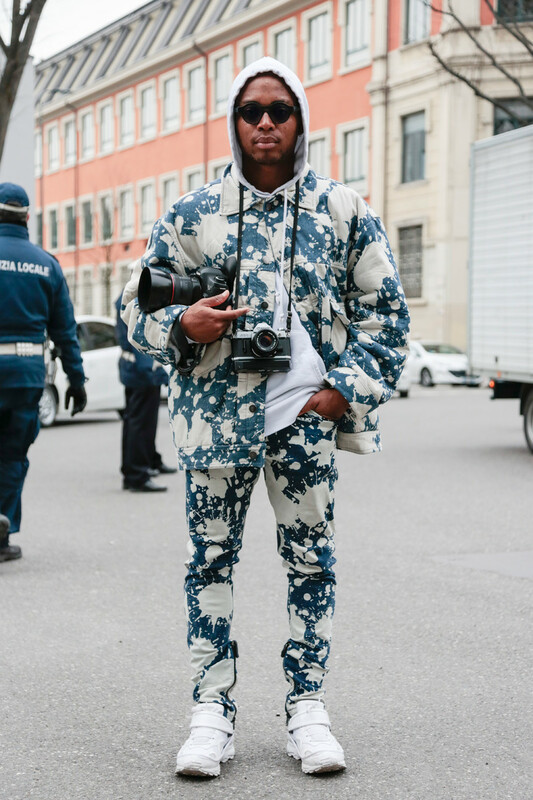 What are you wearing during the fashionweeks? 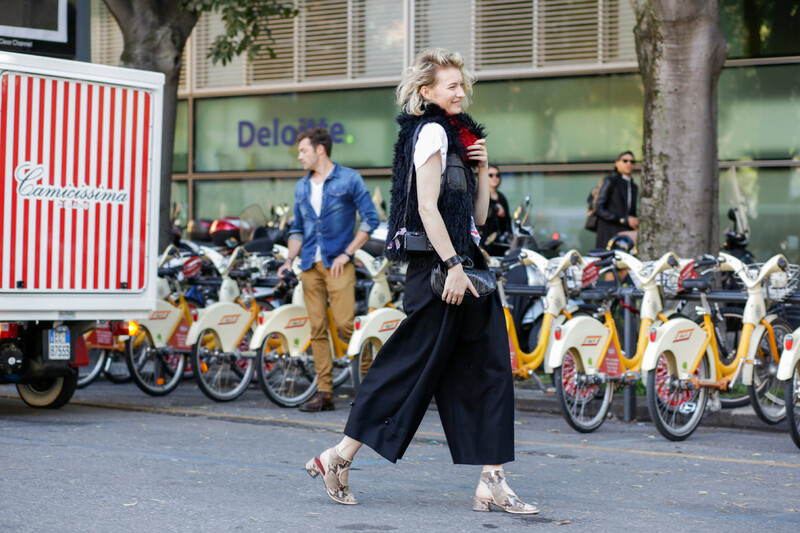 Your Gucci-shoes, that vintage Prada or your latest Vetements-denim? 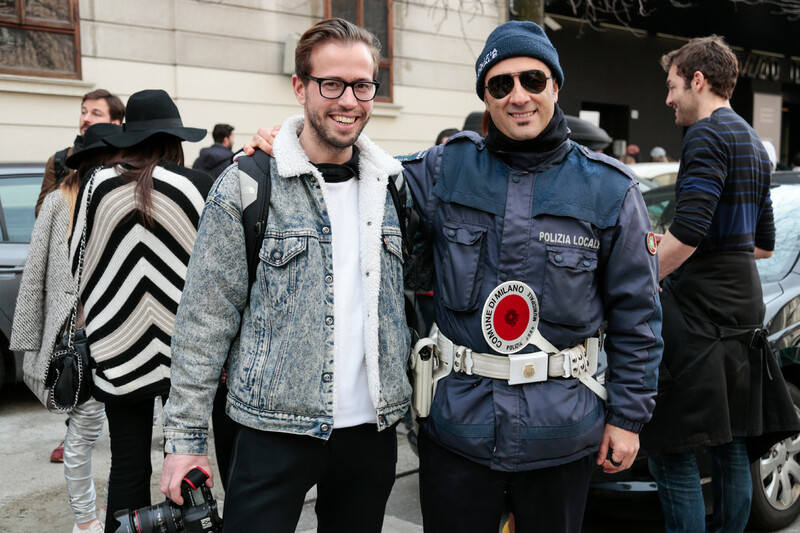 Maybe we’ll spot you in Paris, Milan, New York or Amsterdam. 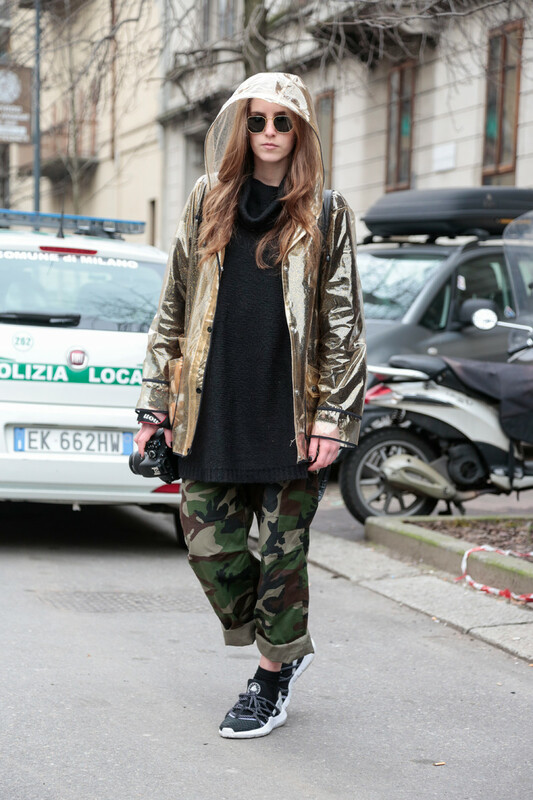 During the fashionweeks we refresh our streetwear posts regularly. 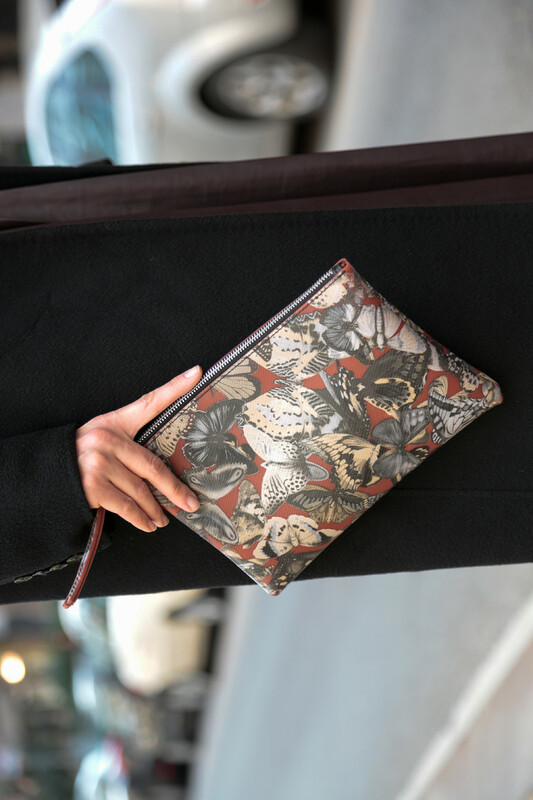 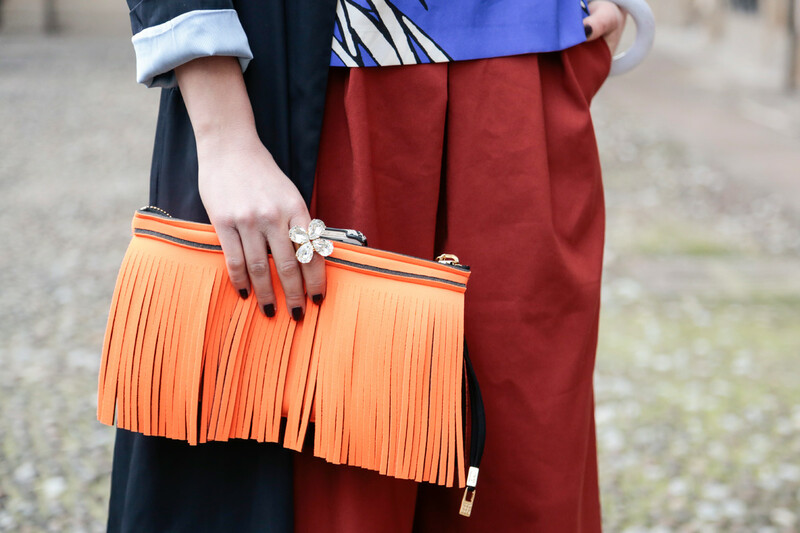 We don’t judge, we’re not the fashion-police, we just enjoy fashion and your own personal style. 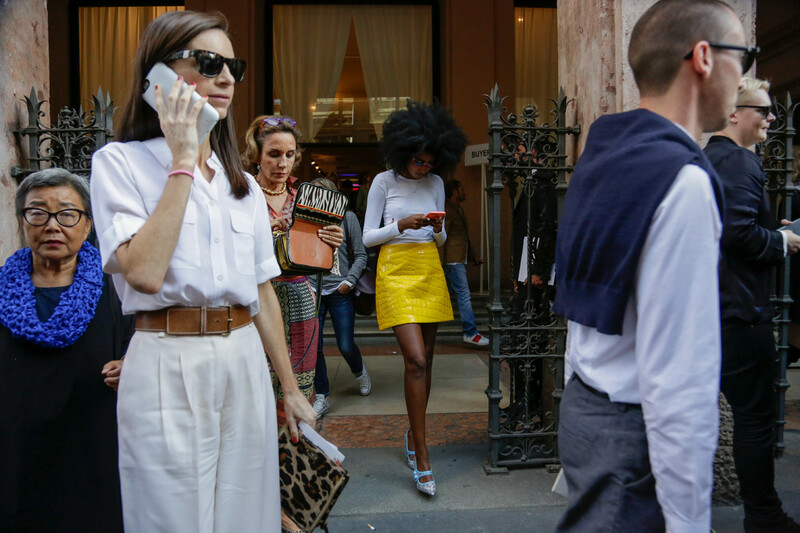 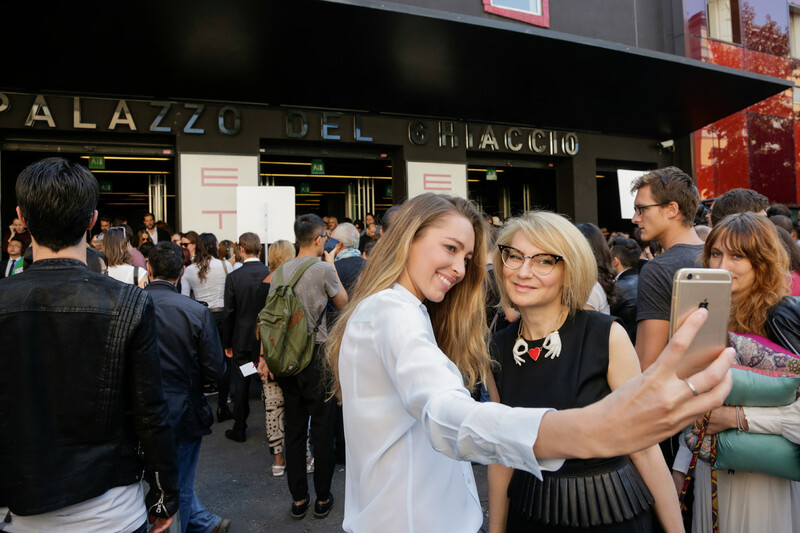 Next stop: Milan Womenswear Fashion Week spring/summer 2017. 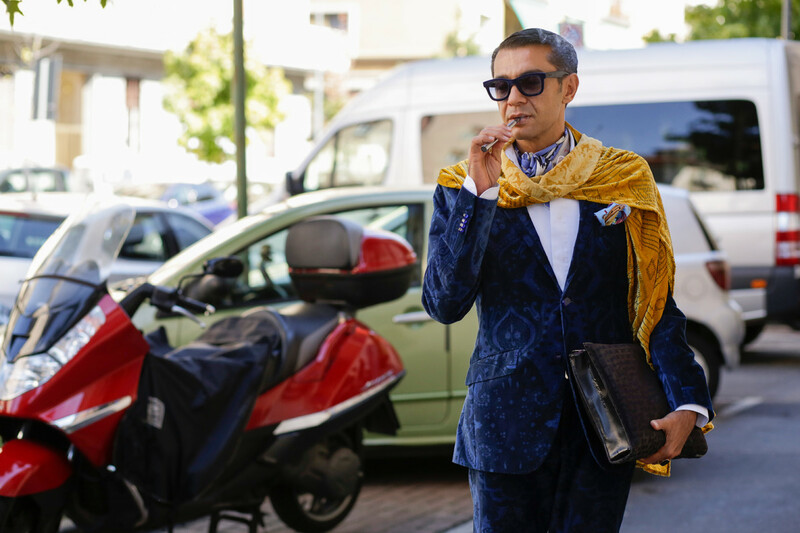 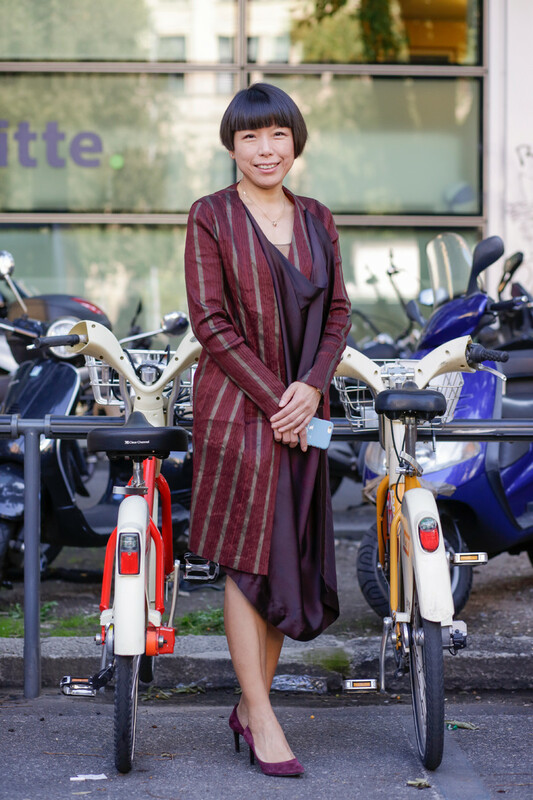 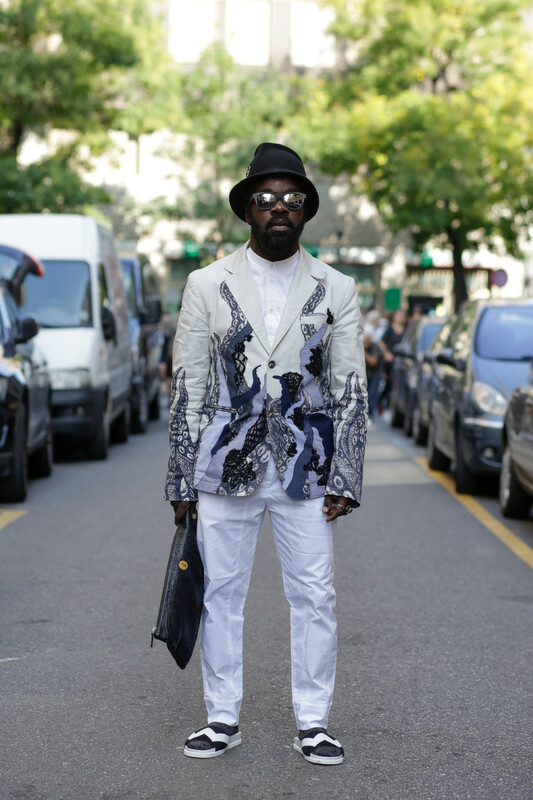 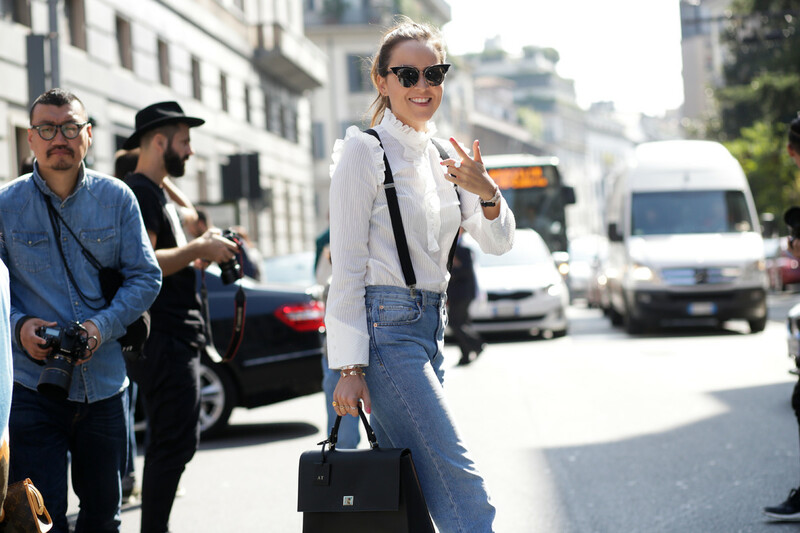 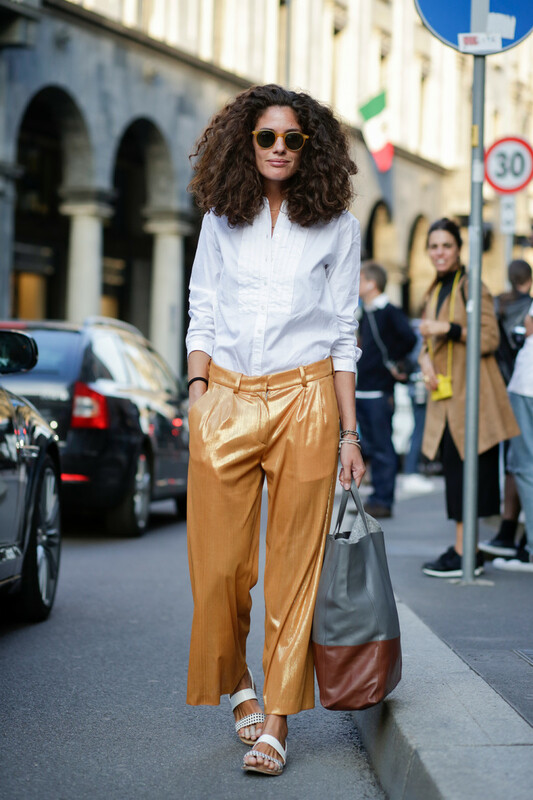 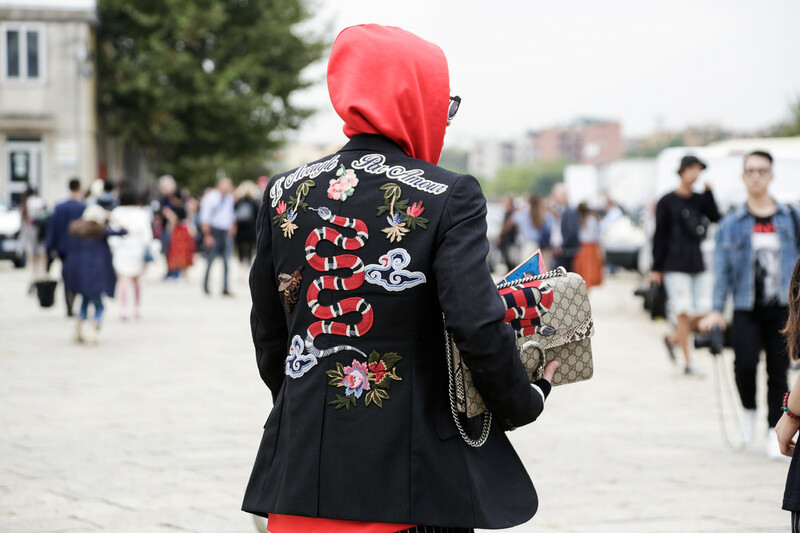 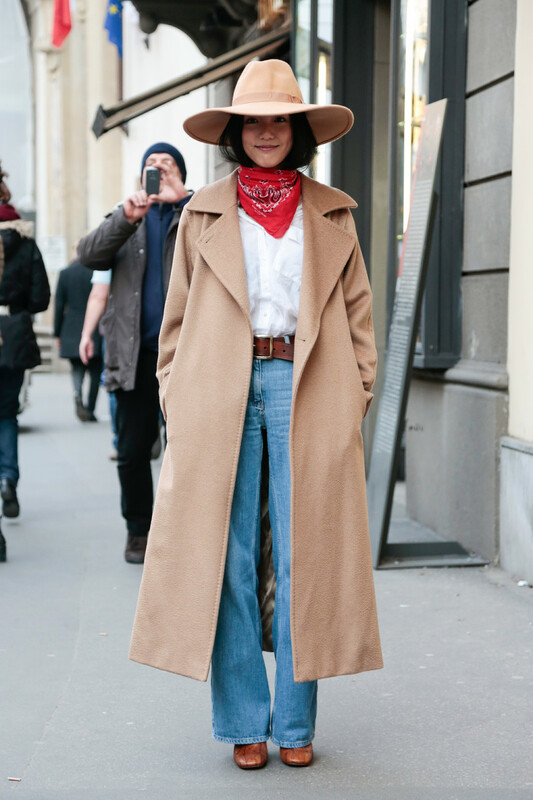 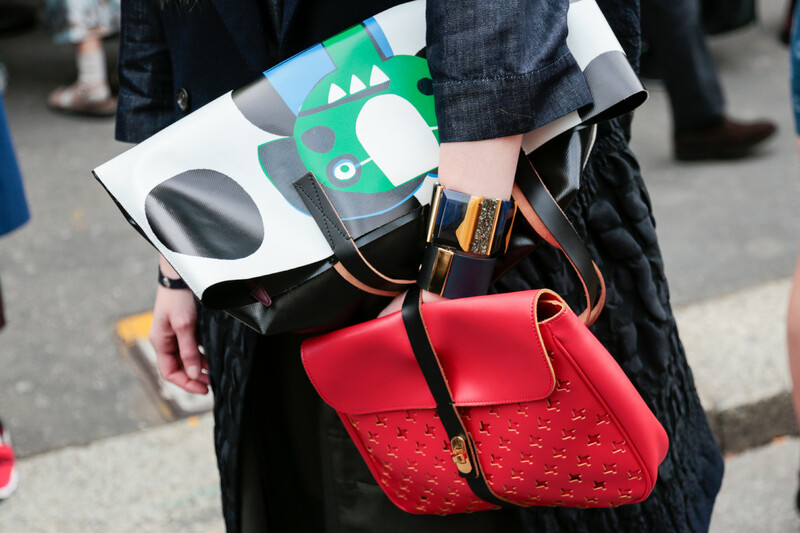 What are you wearing during the fashion weeks? 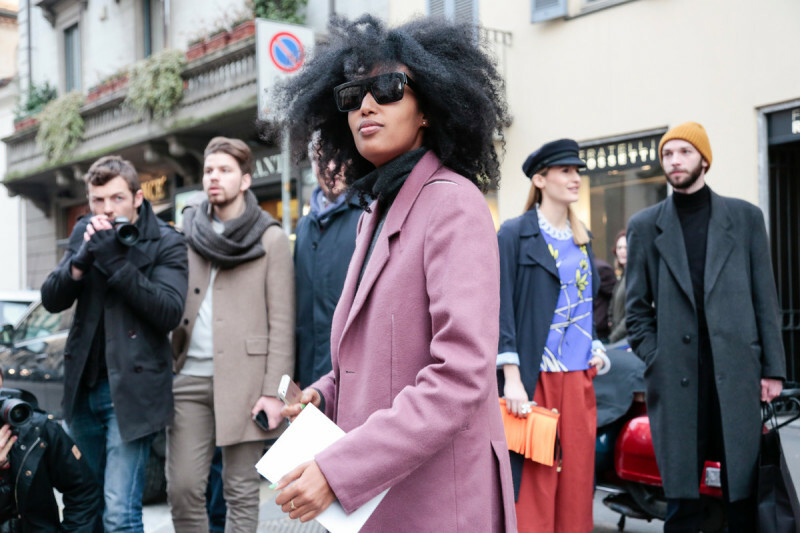 Your Burberry-boots, that vintage Dior or your latest Celine coat? 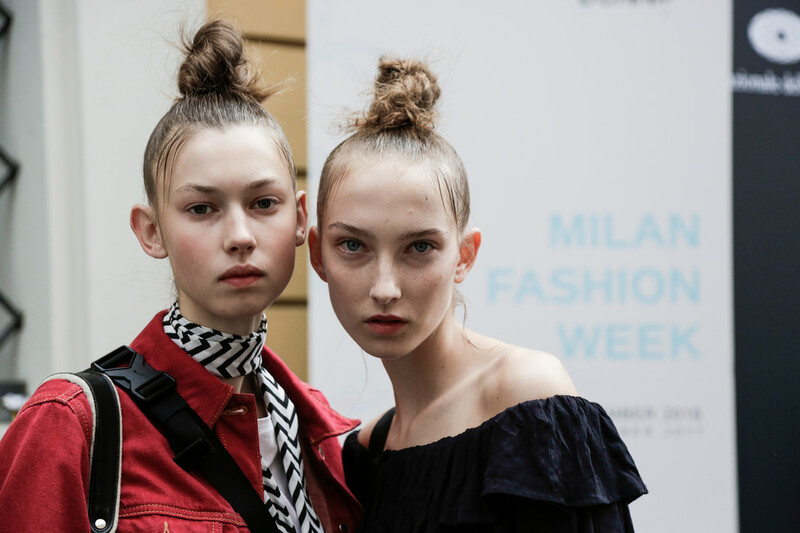 Maybe we’ll spot you in Paris, Milan, New York or Amsterdam. 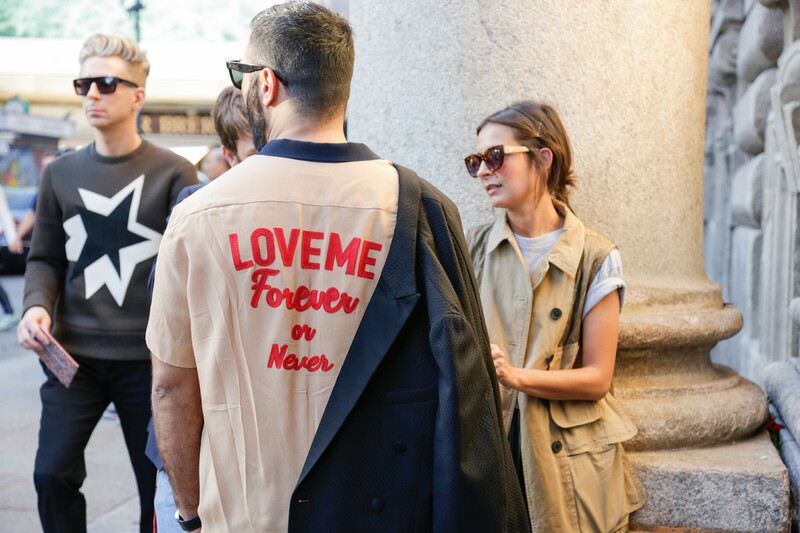 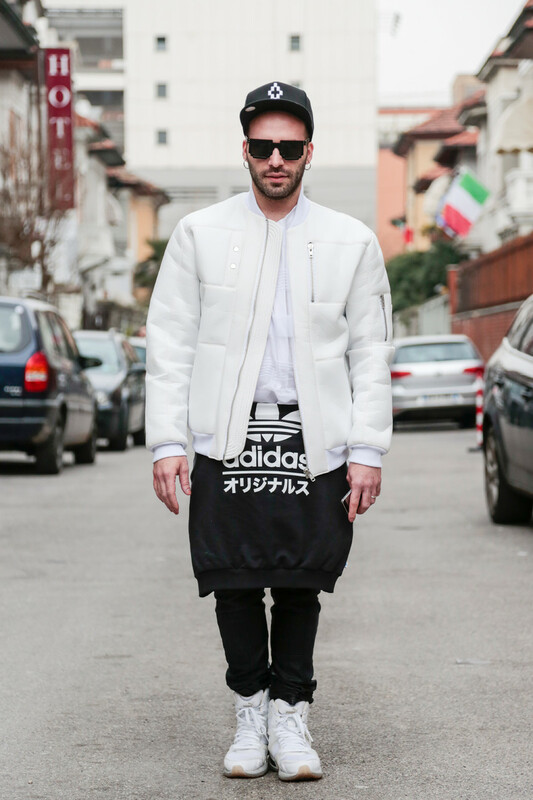 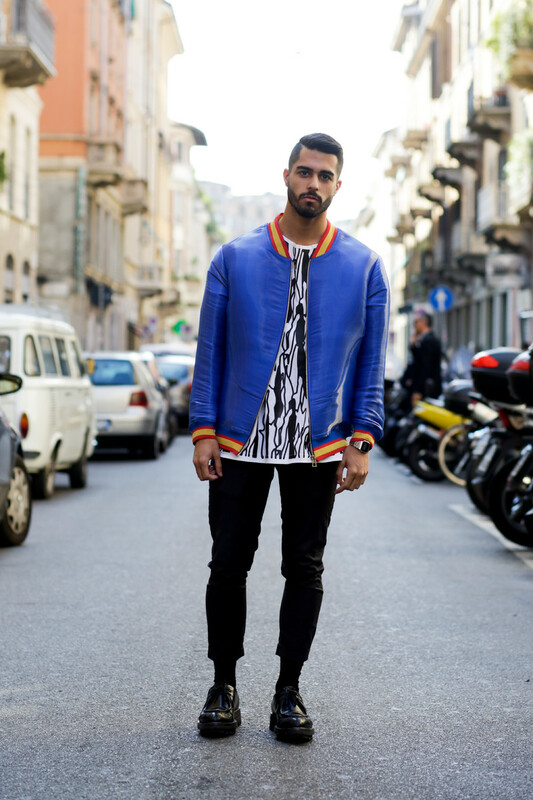 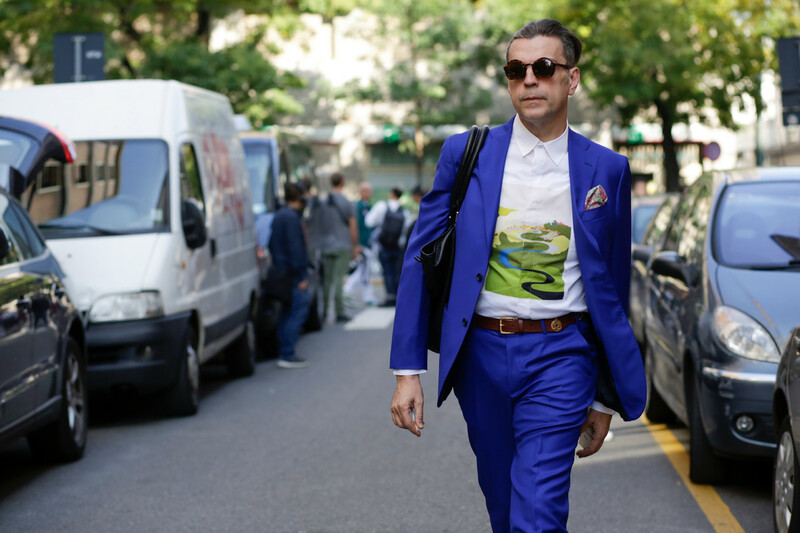 During the fashion weeks we refresh our streetwear posts regularly. 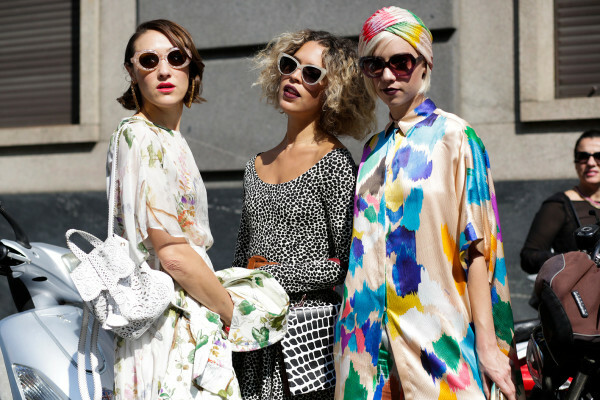 We don’t judge, we’re not the fashion-police, we just enjoy fashion and your own personal style. 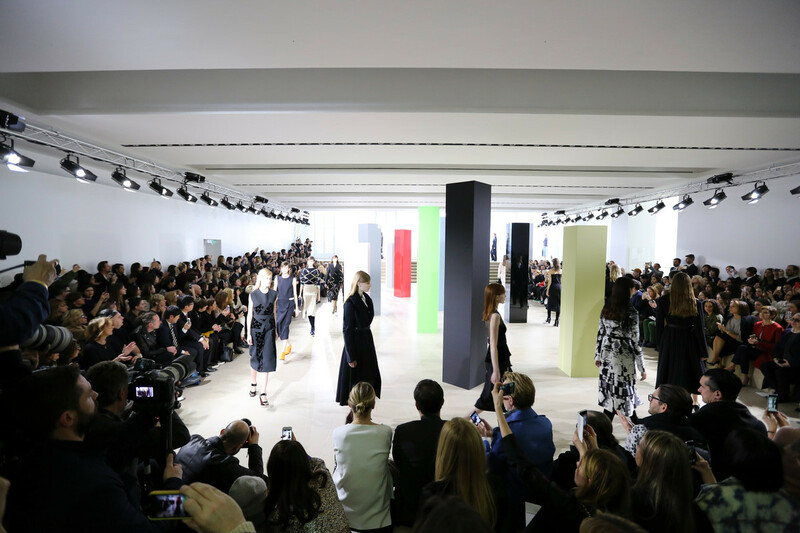 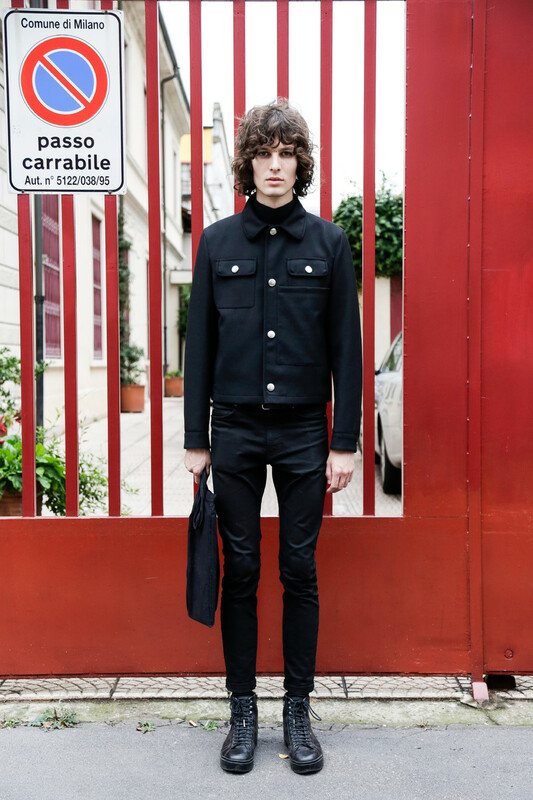 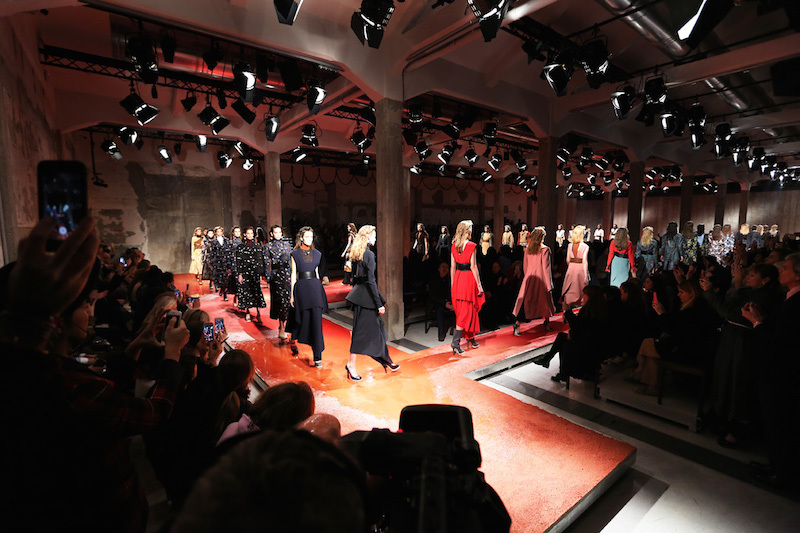 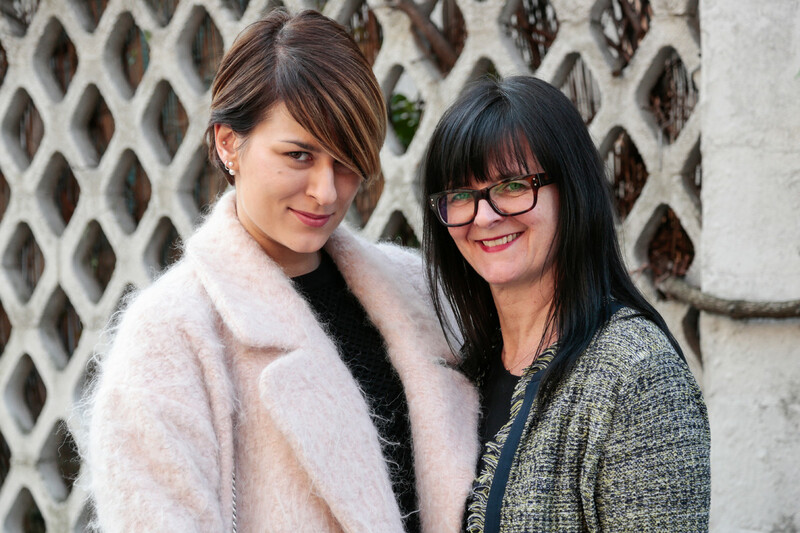 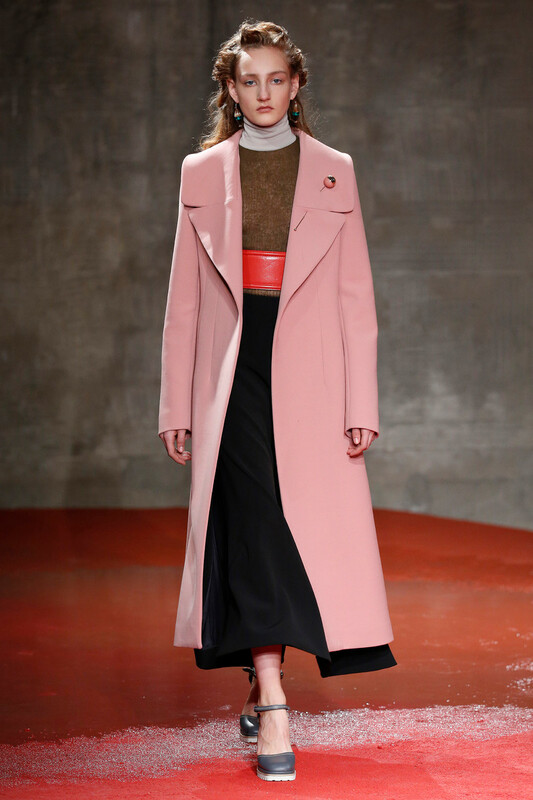 Next stop: Milan Fashion Week fall/winter 2015. 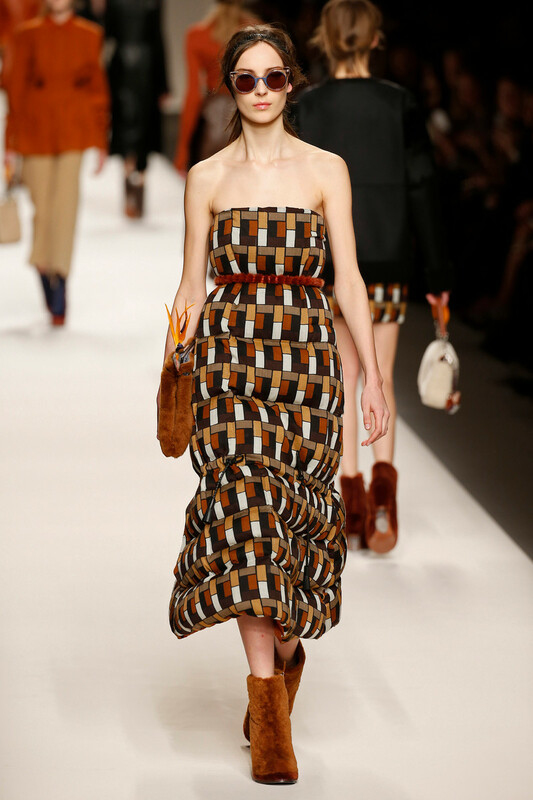 Please enjoy the pictures, our review and show report will follow shortly. 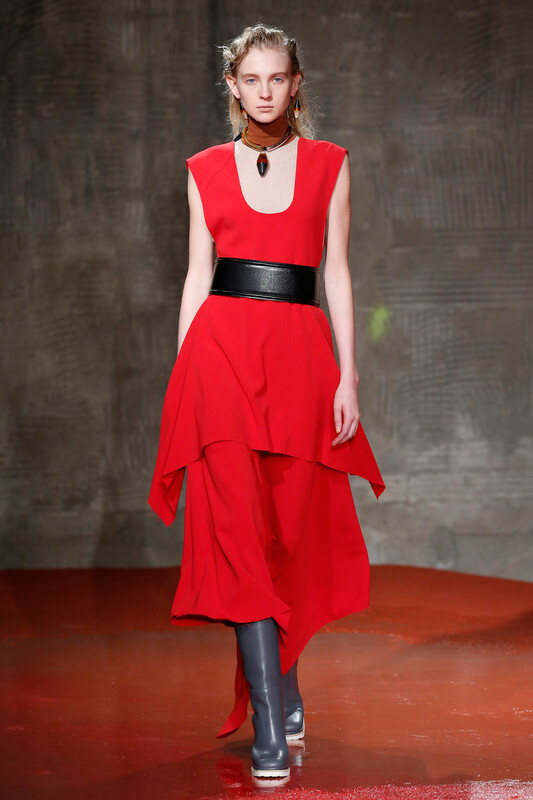 Our review will follow shortly for now please enjou our images. 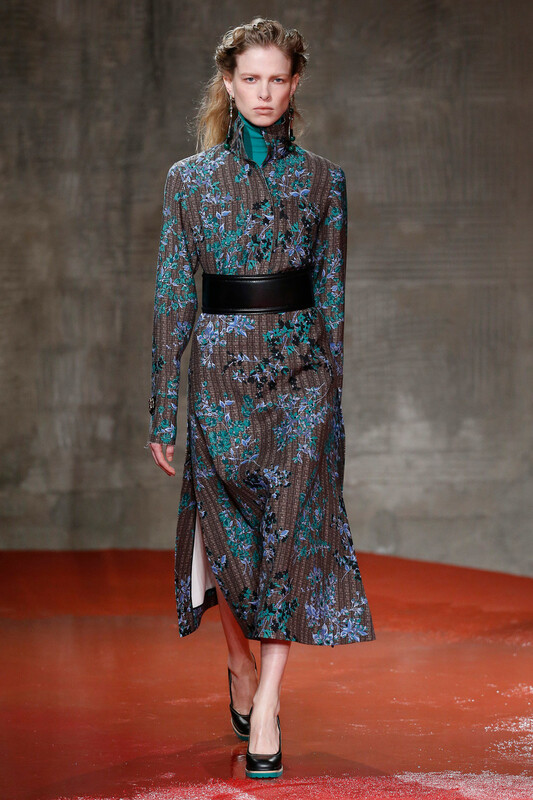 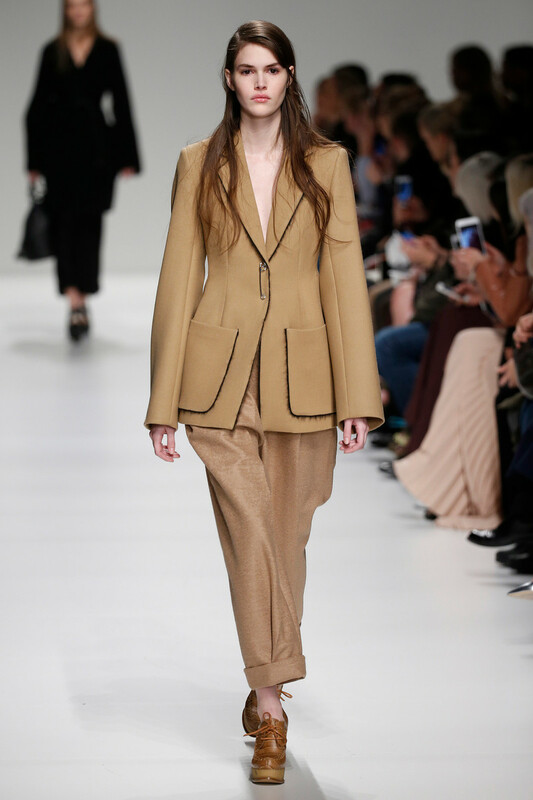 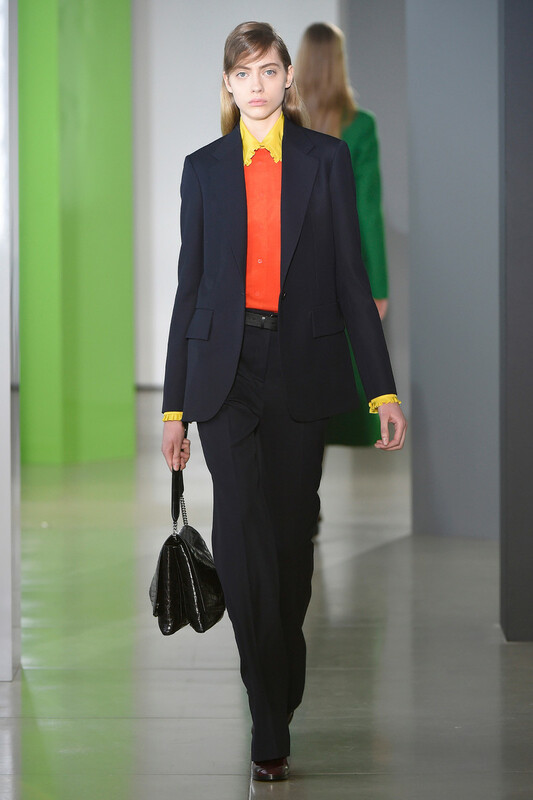 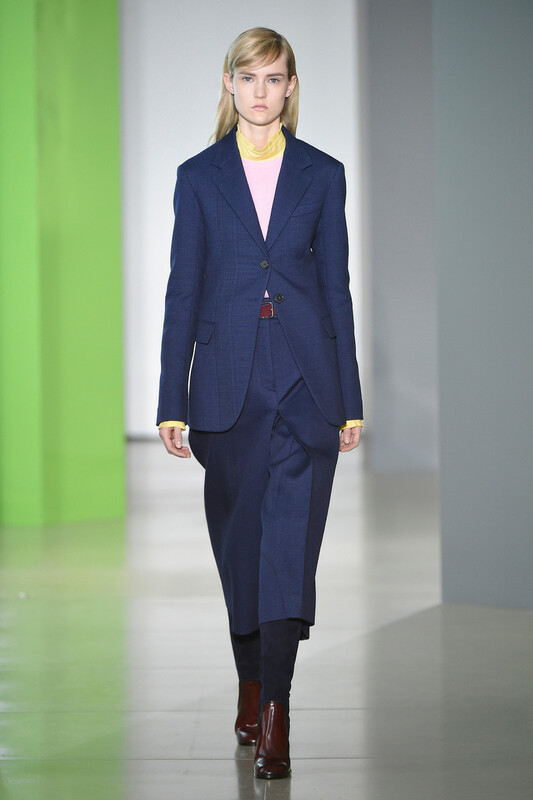 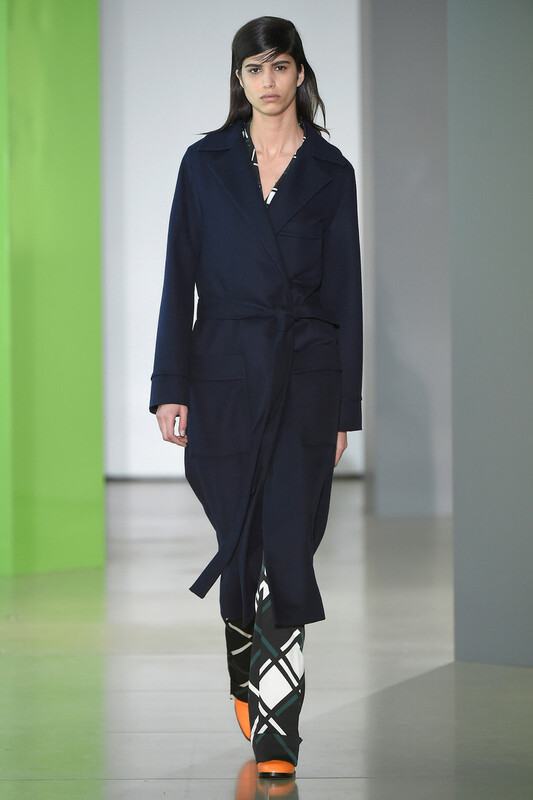 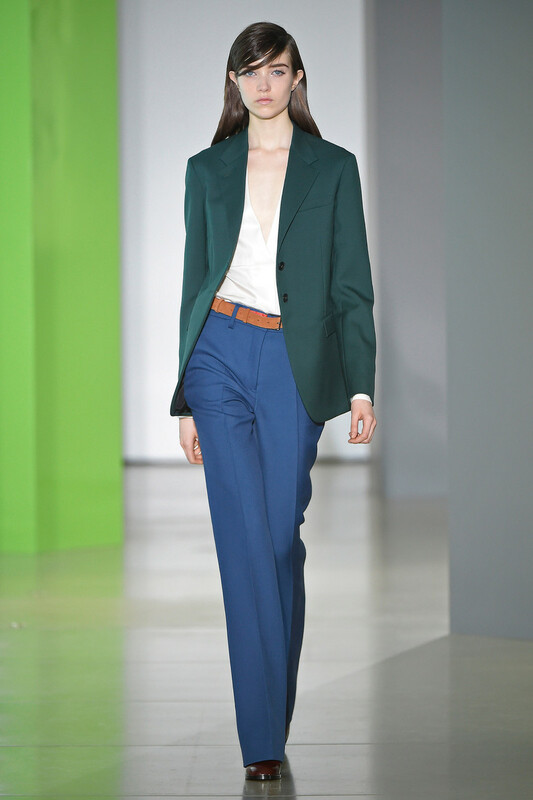 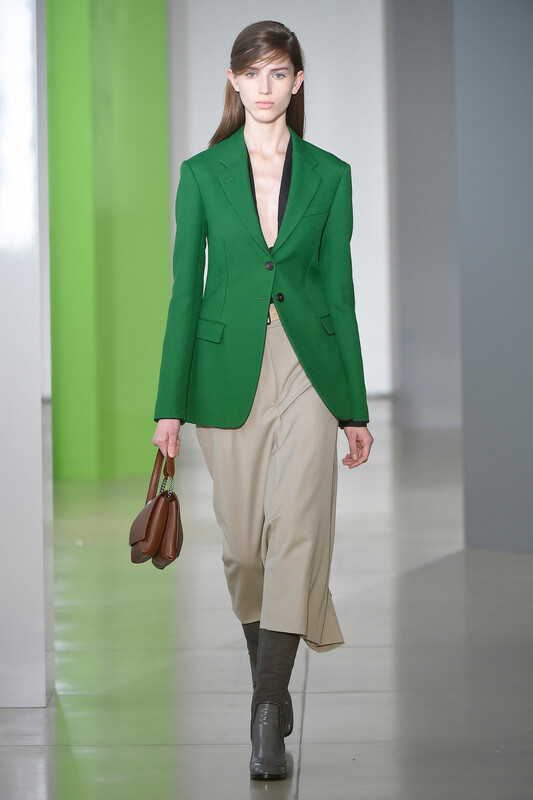 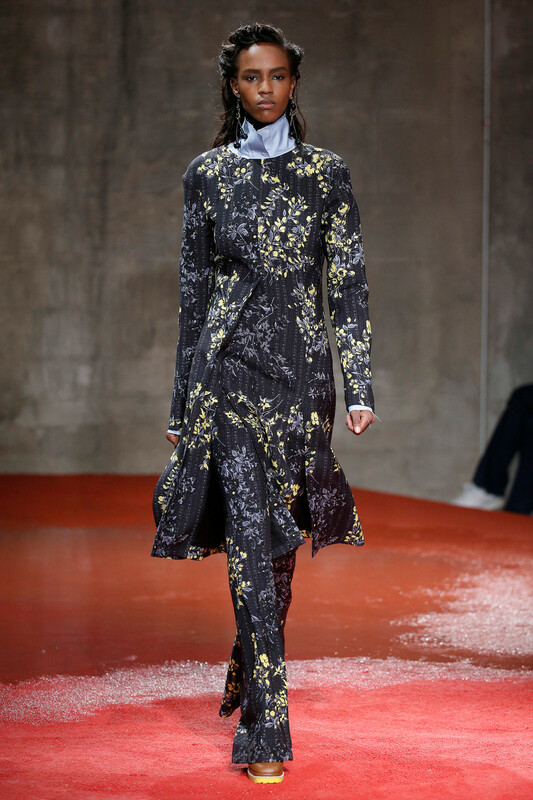 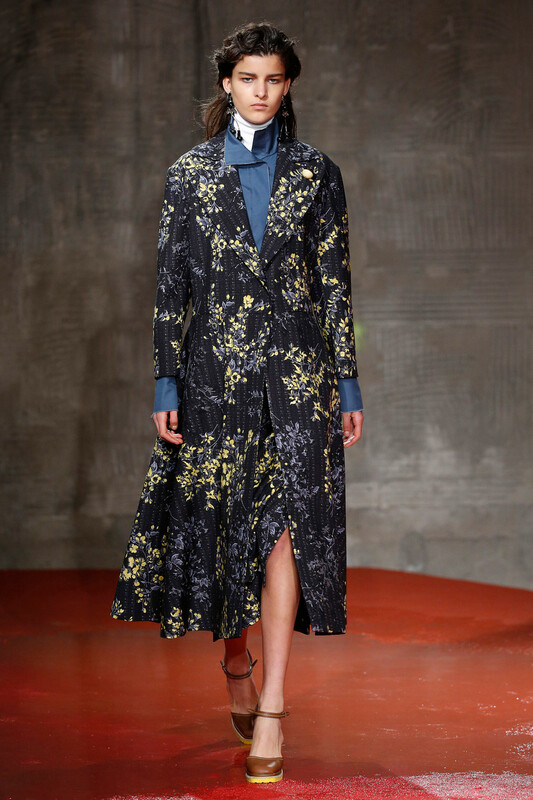 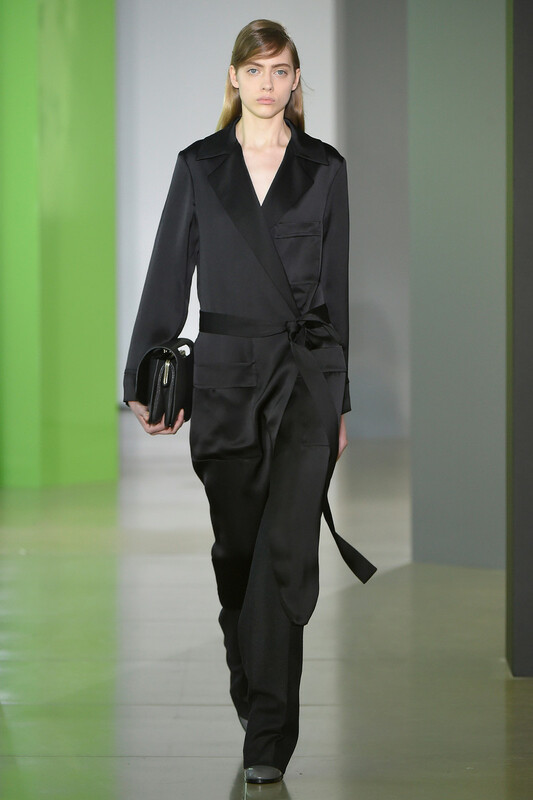 Sportmax embraced the country life for fall, incorporating rugged and Western elements as well as pretty wildflowers with artful elegance. 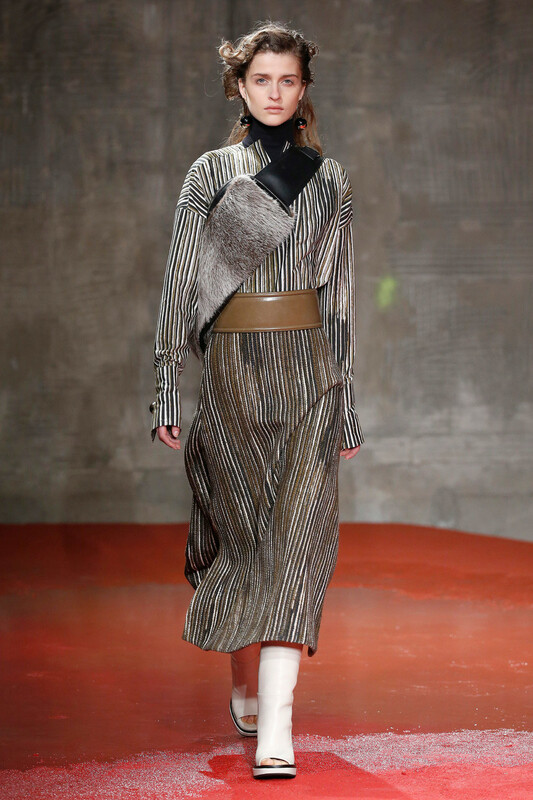 It was a great collection of outerwear and knits that exuded soft femininity with a graceful rustic edge, all of it perfectly wearable. 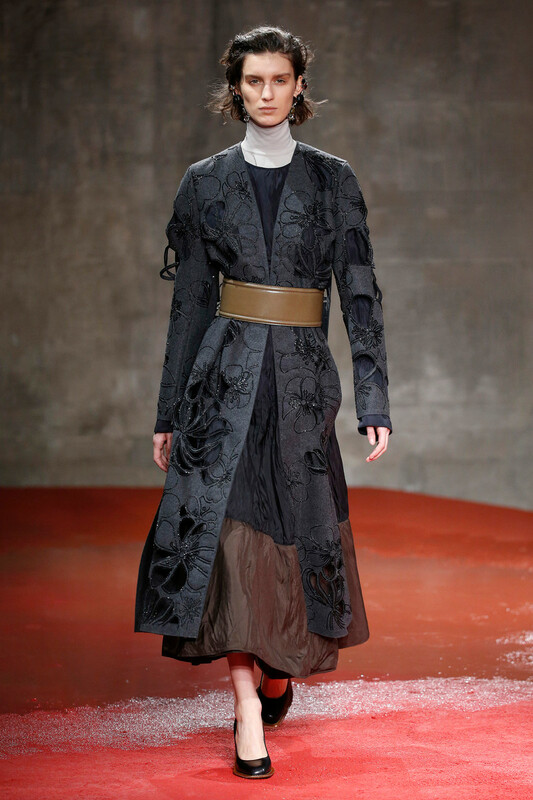 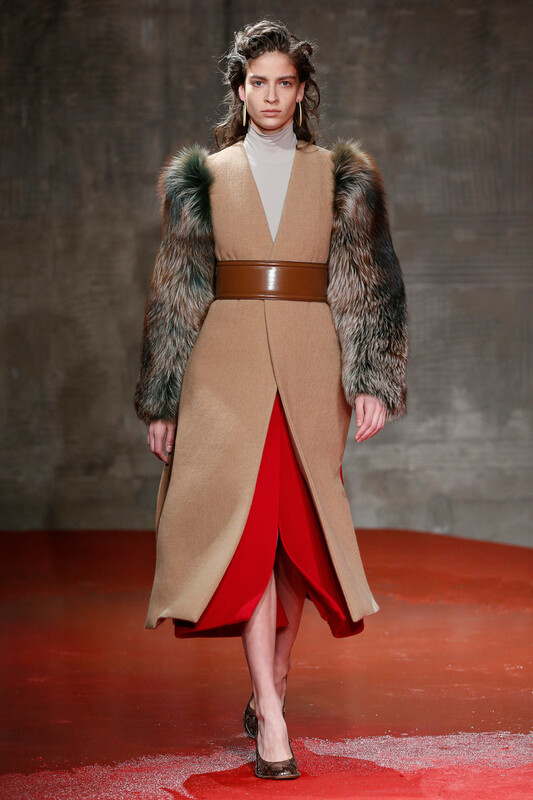 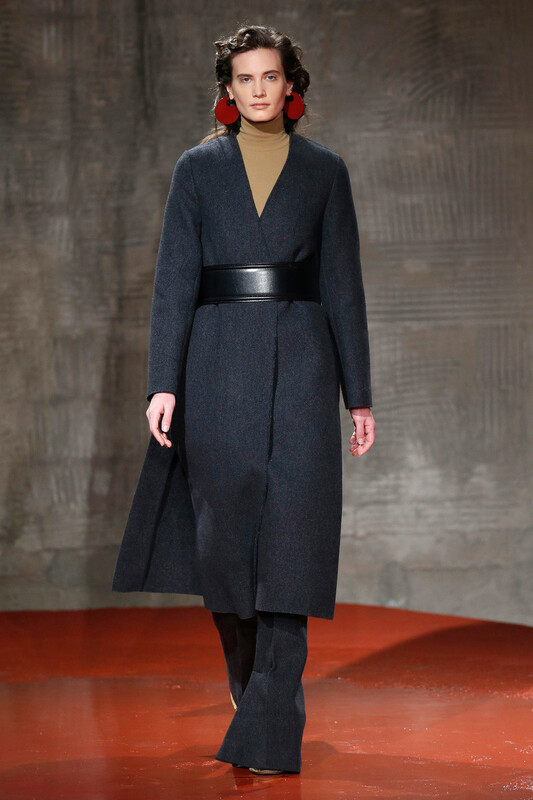 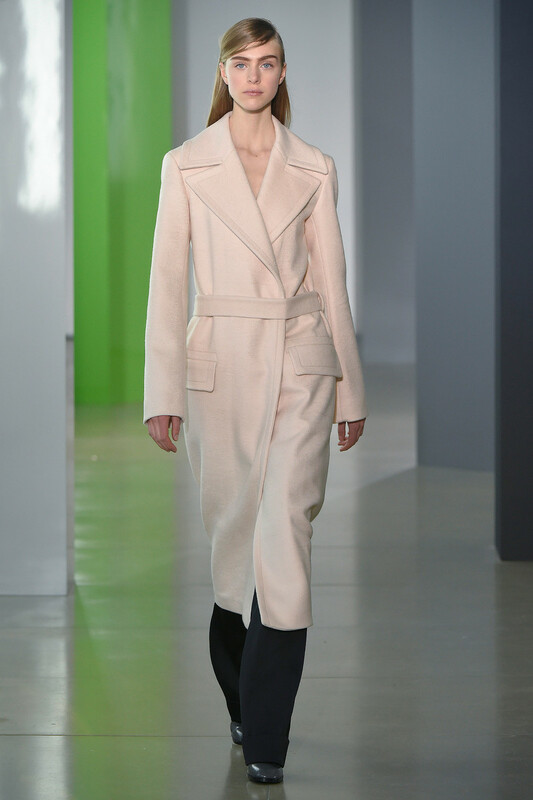 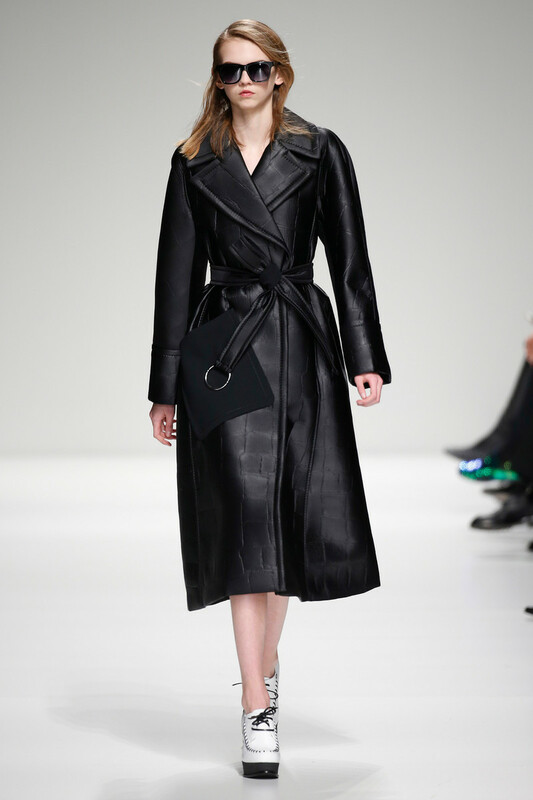 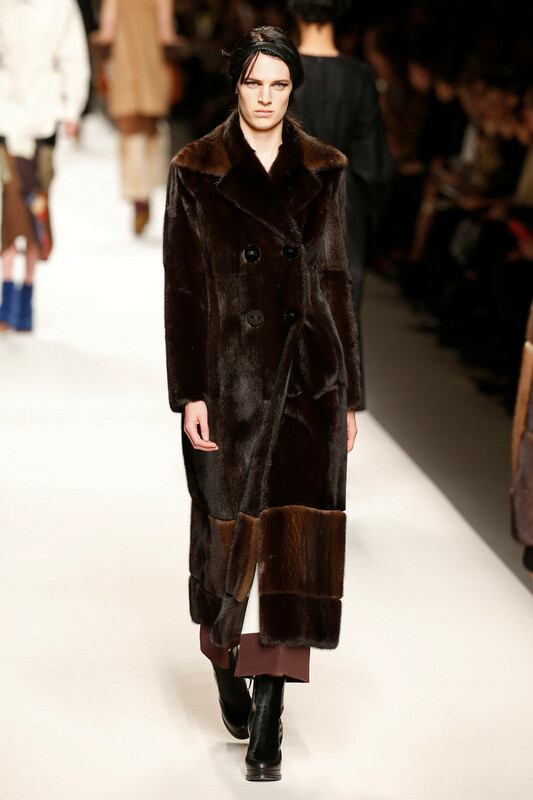 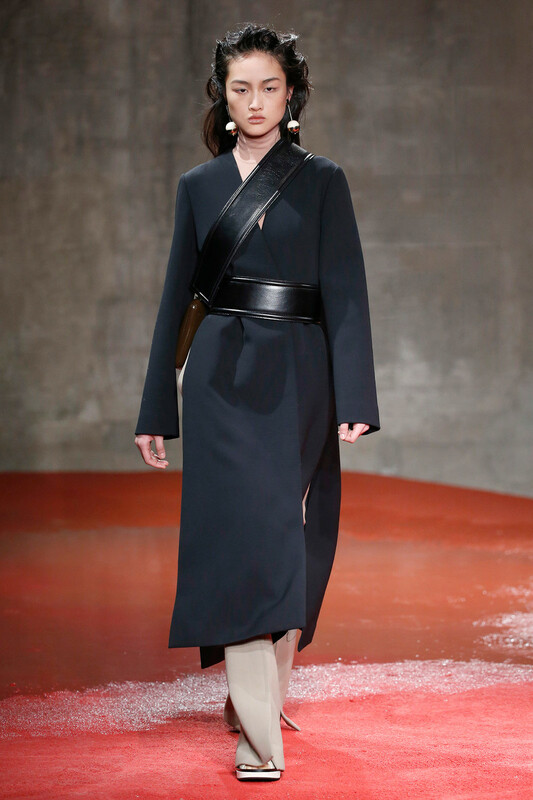 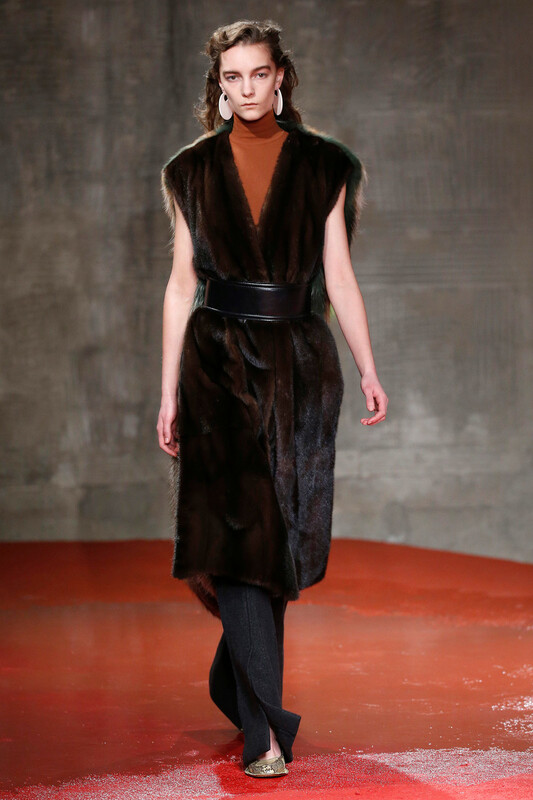 The dominant coat silhouette was a gentle wrap in black and camel double cashmere trimmed with raw blanket stitching and tied with a corded leather belt that created a gentle hourglass shape. 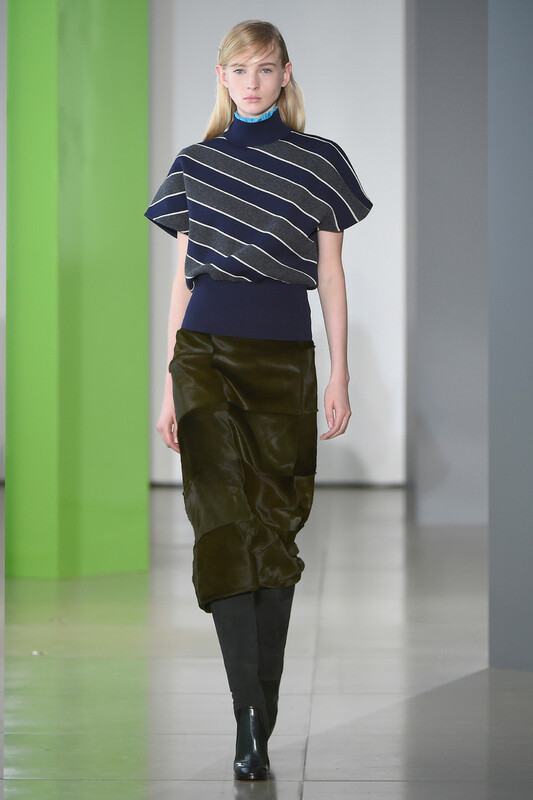 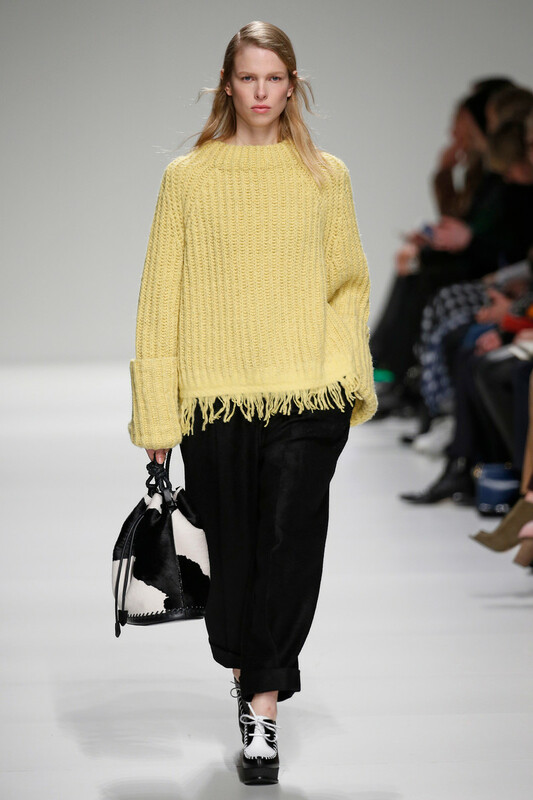 Chunky Aran knits came as off-shoulder dresses and tops with exaggerated fold-over collars and fringed hems. 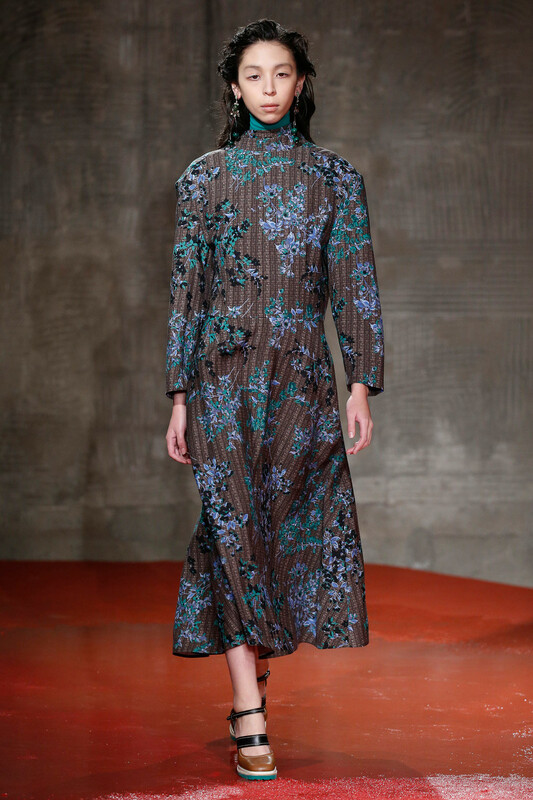 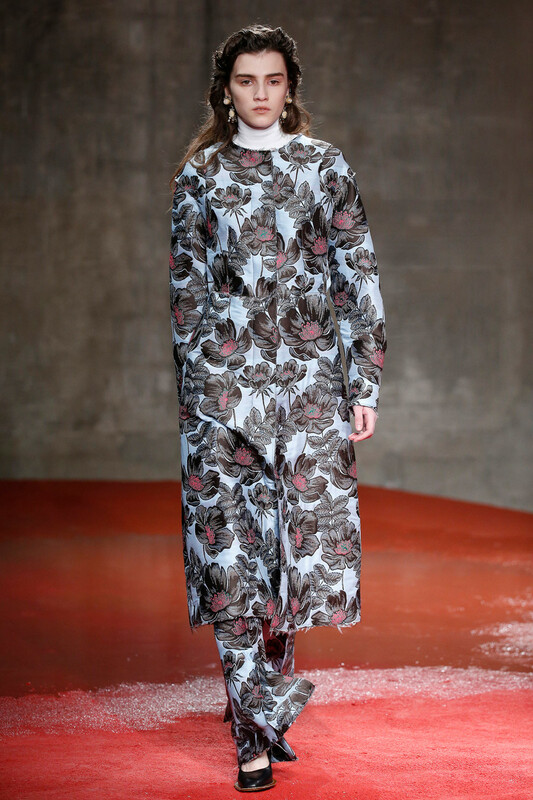 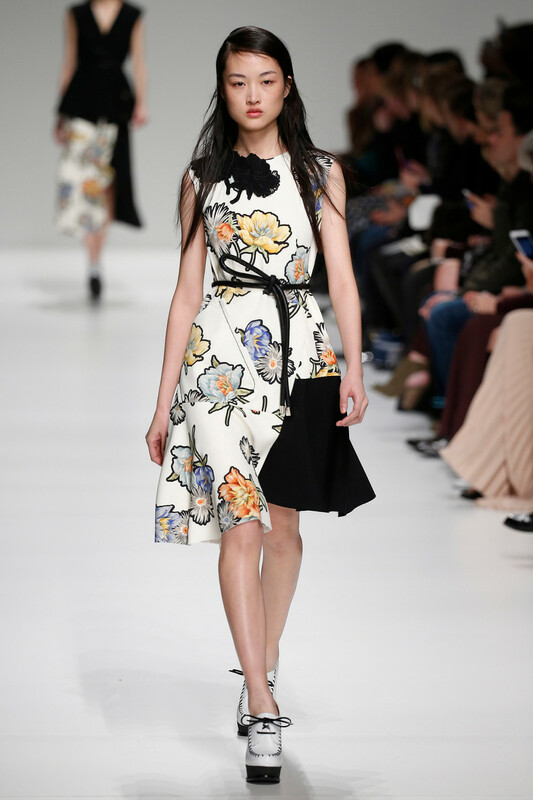 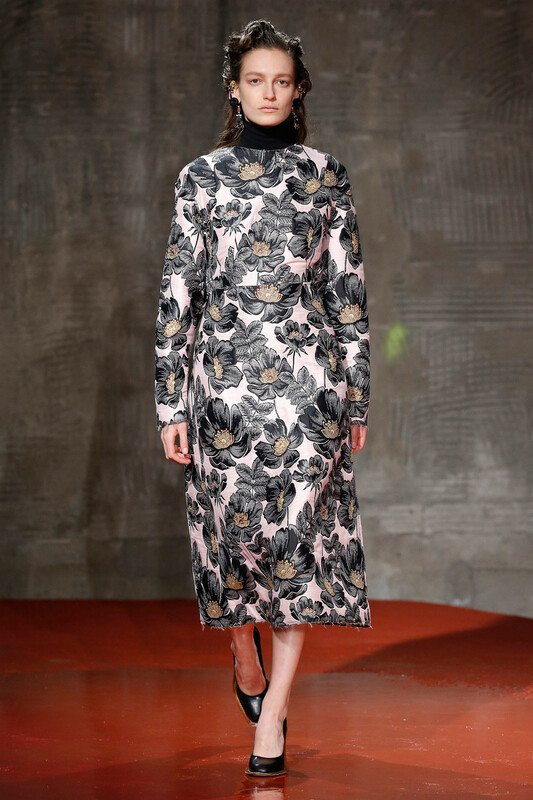 There was an easy, vaguely Eastern feel to the asymmetrical cuts, particularly with the oversize floral prints of anemones and chrysanthemums silhouetted in black against white backgrounds on easy color-blocked dresses and wrap tops and skirts, again with corded details. 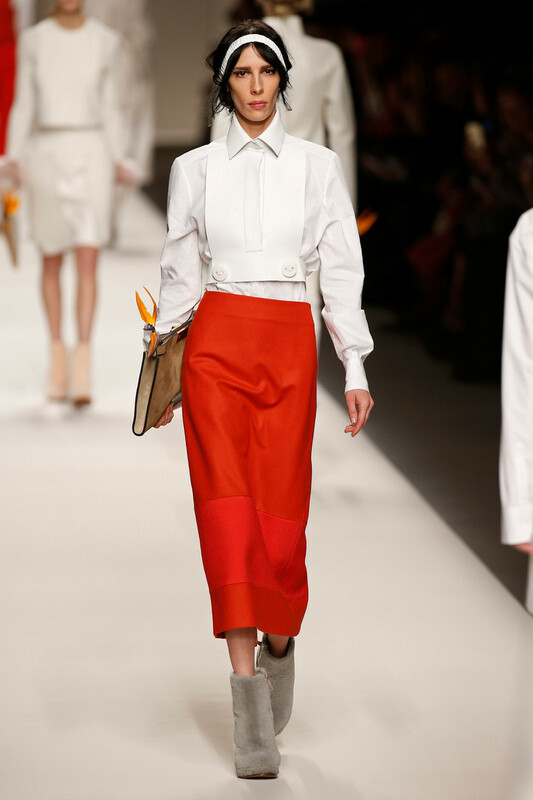 Marilyn Monroe was the muse of the Max Mara design team. 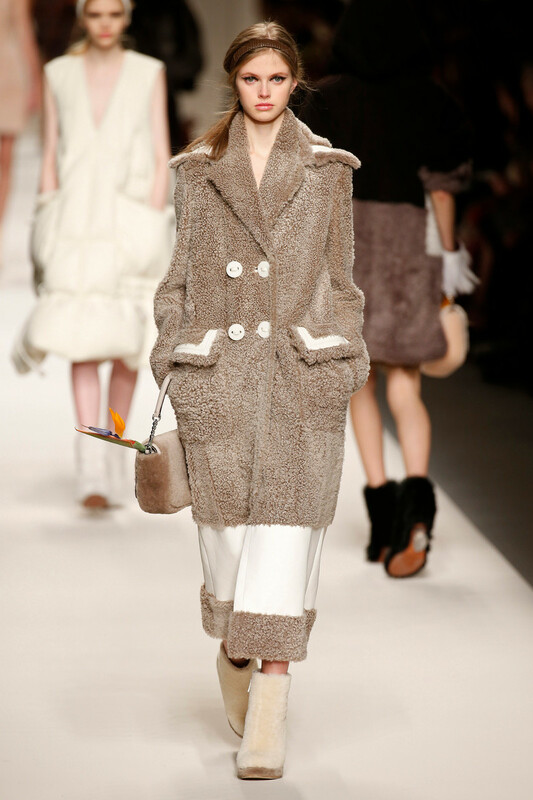 Her famous 1962 beach shoot with George Barris, in which she covered up in a Norwegian sweater, camel blanket and sea-green towel, fueled the color scheme and lineup of retro bombshells in deluxe knits and coats. 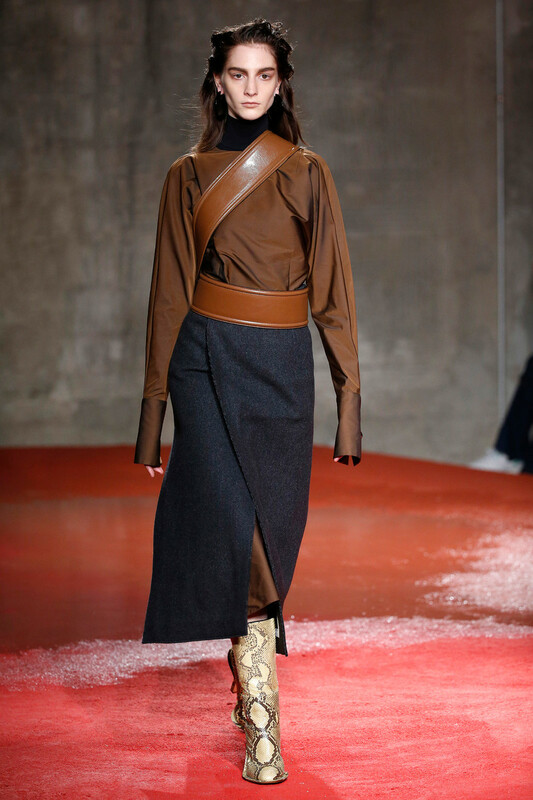 Gigi Hadid, the model of the moment, opened and closed the show in a pair of mannish camel coats clutched around her like she had a chill, covering everything but her cleavage. 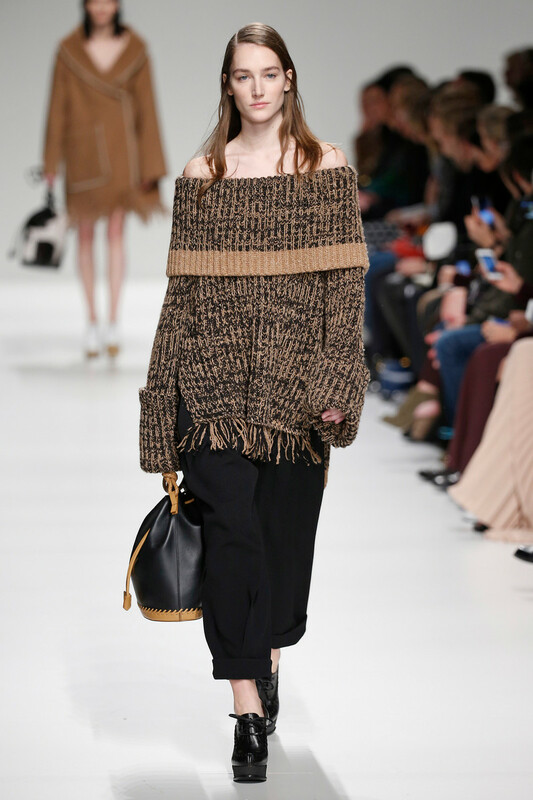 An oversize take on the traditional camel cable knit was pretty perfect. 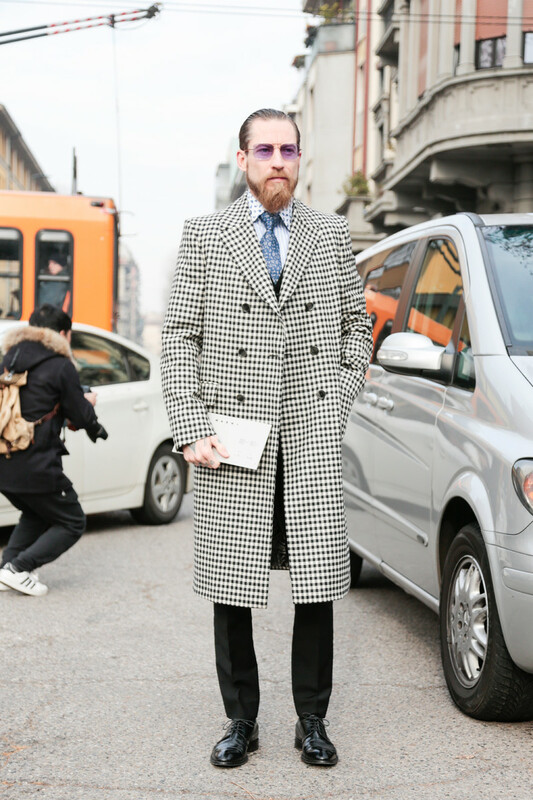 Anyone in the market for a big coat to sink into next season will have options: a nubby tailored overcoat; a turquoise fur; a pale-pink brushed alpaca. 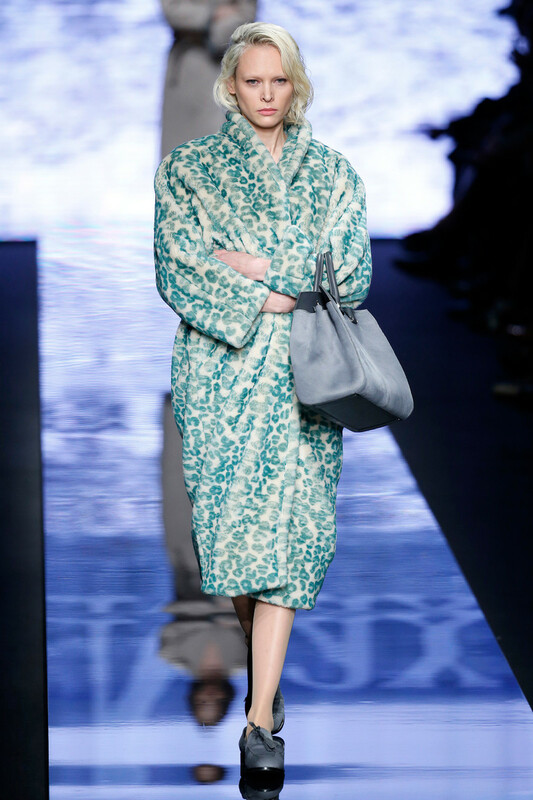 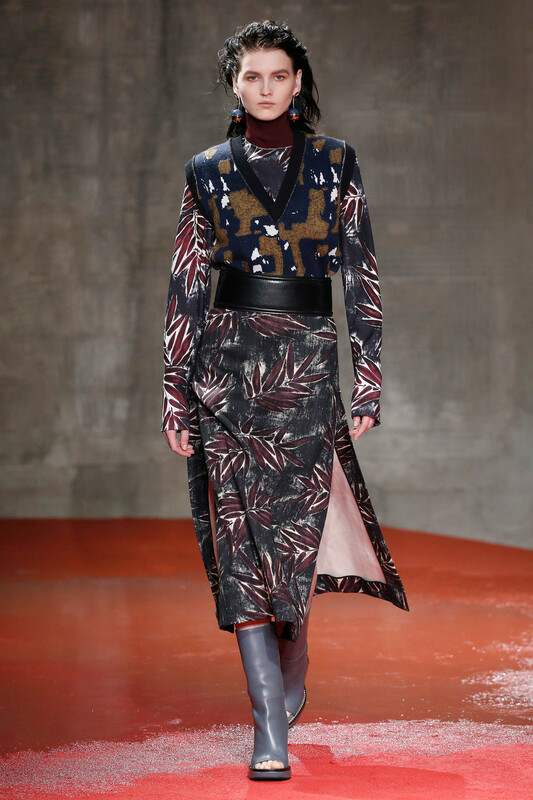 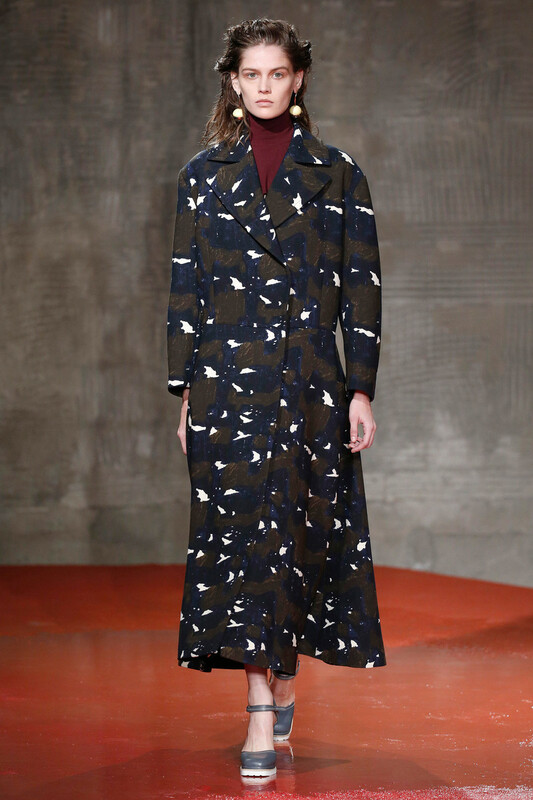 For novelty, there were colorful leopard prints and shiny quilted silk styles with fur linings. 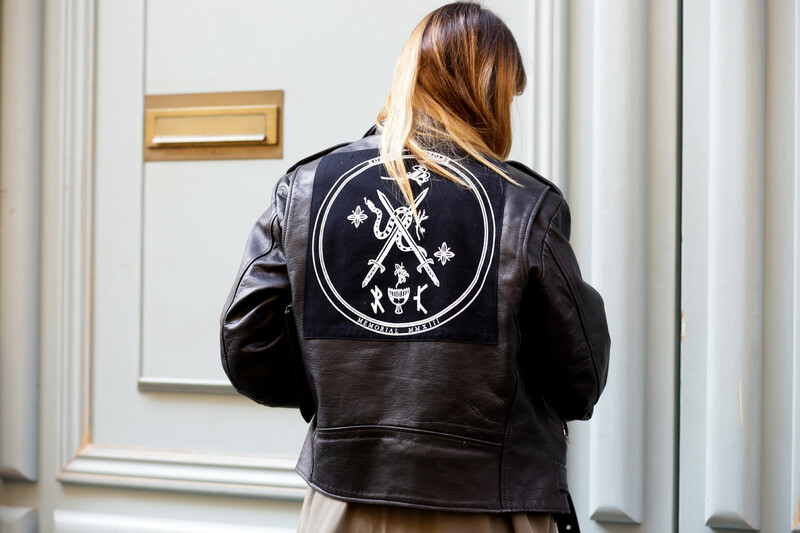 Retro lady bombers, sweatshirts and pencil skirts fleshed out the merchandise for those who want something to wear under the coats. 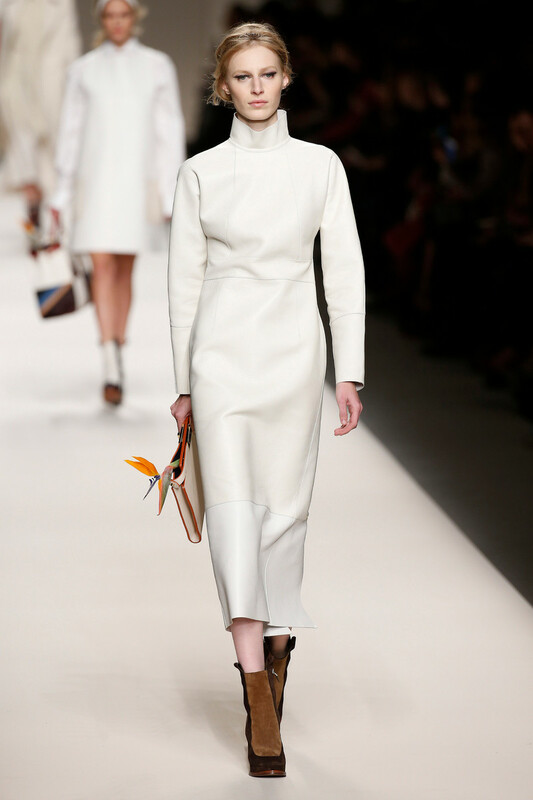 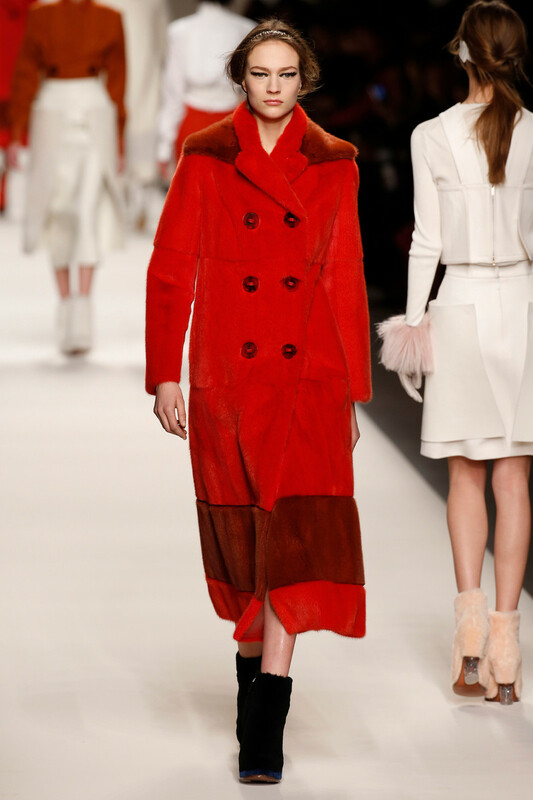 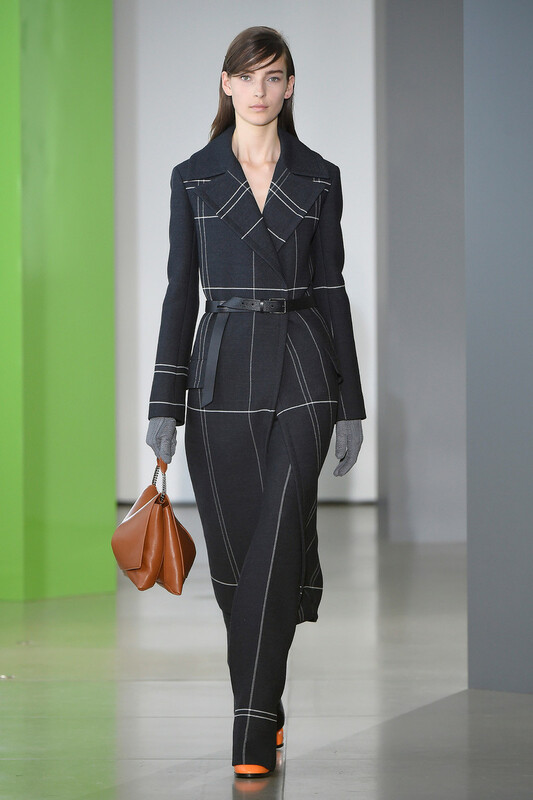 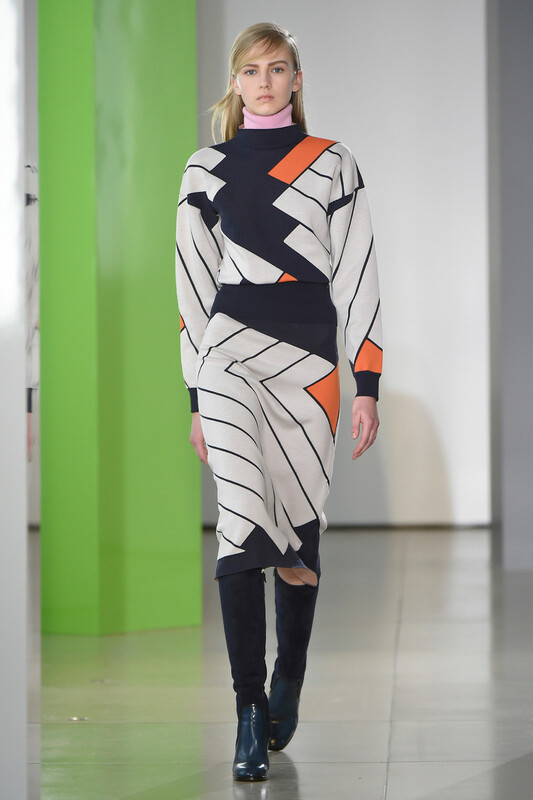 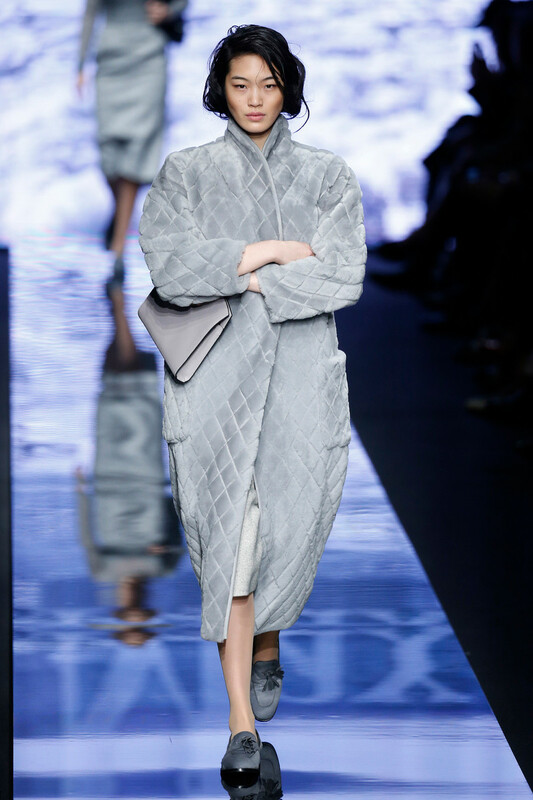 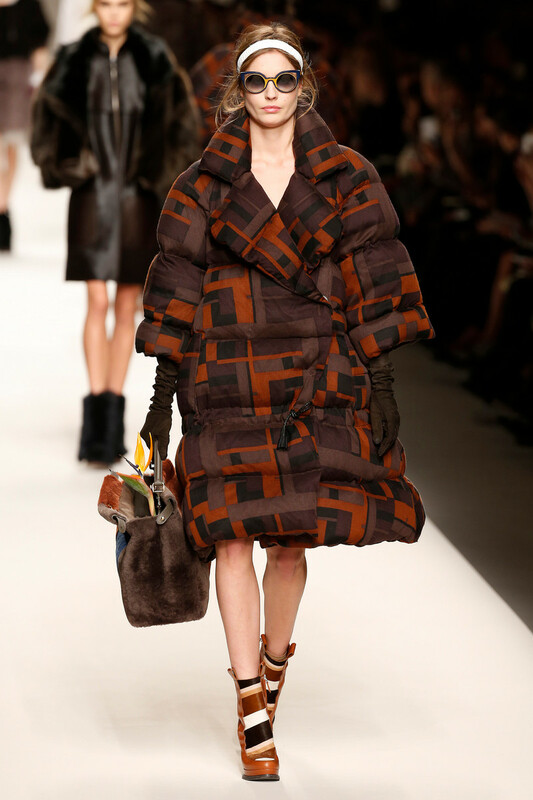 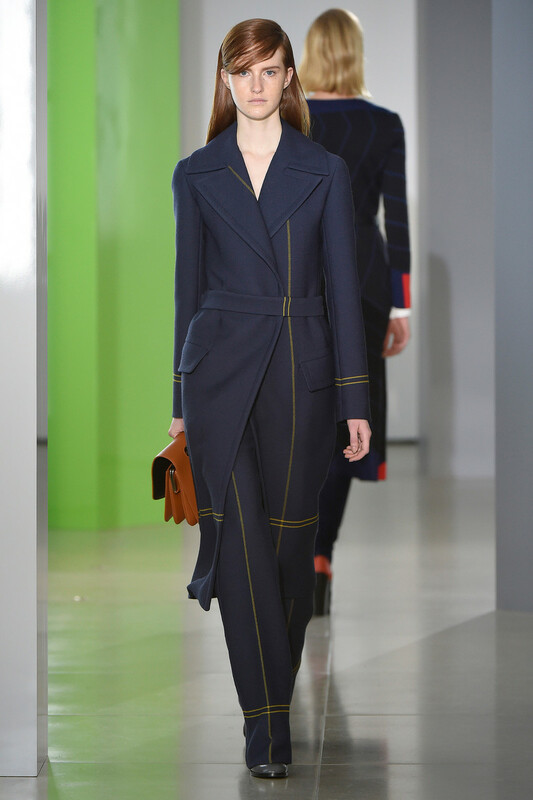 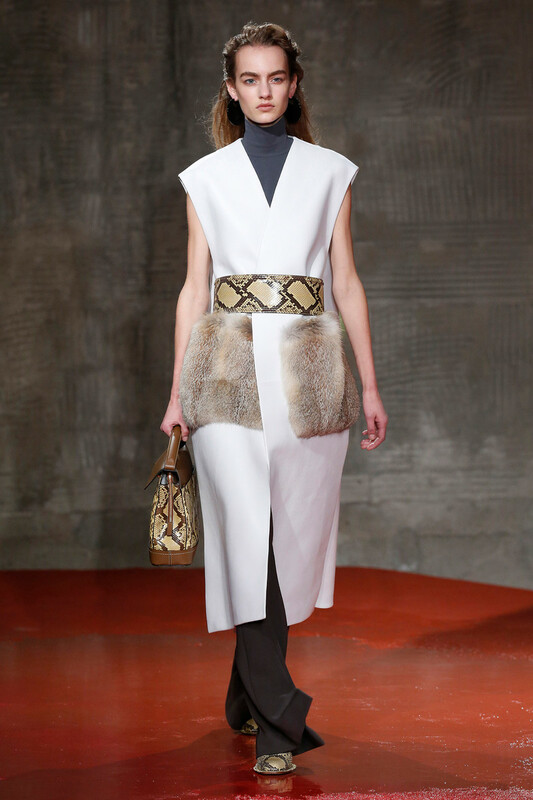 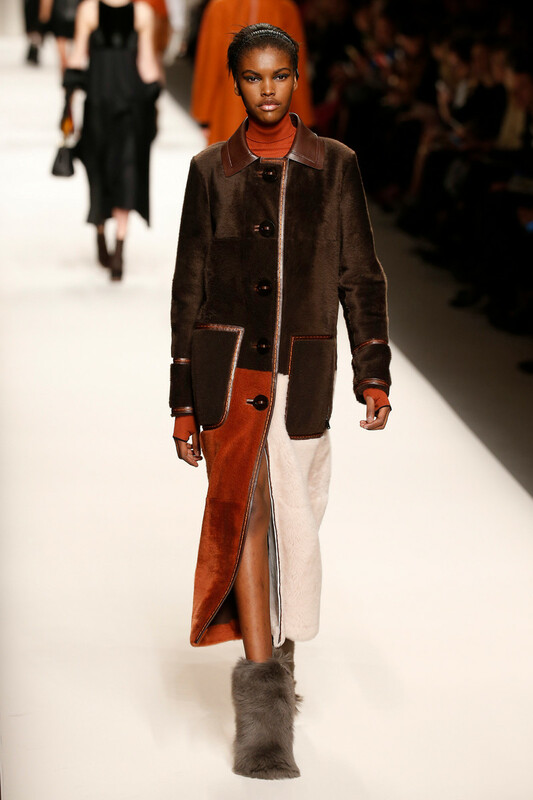 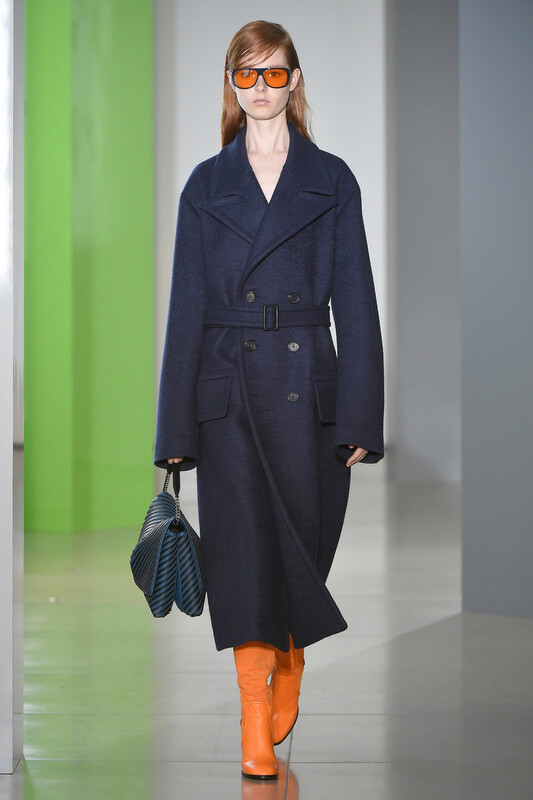 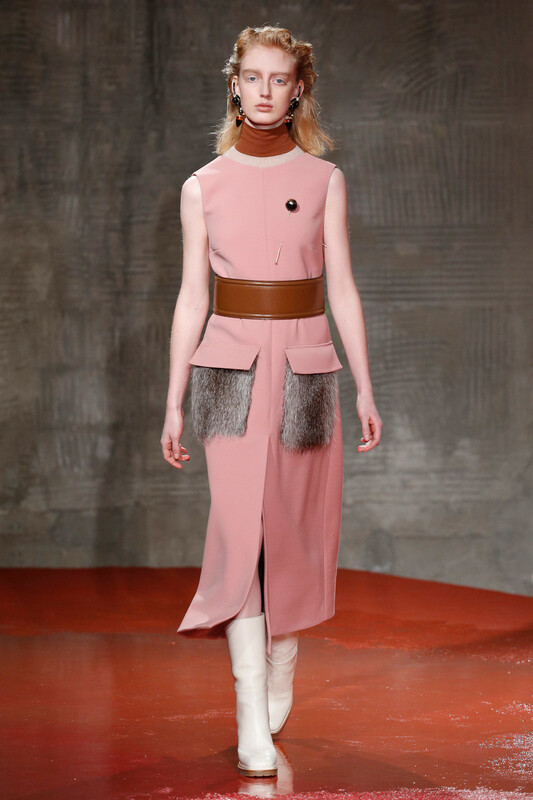 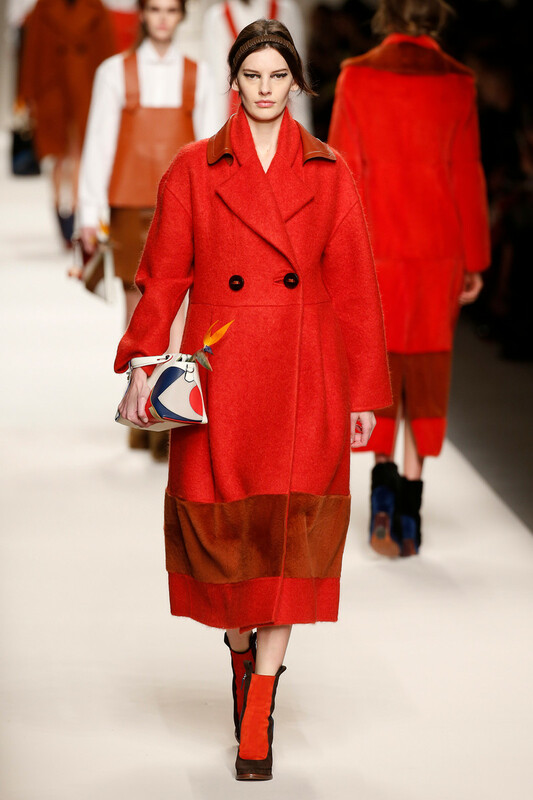 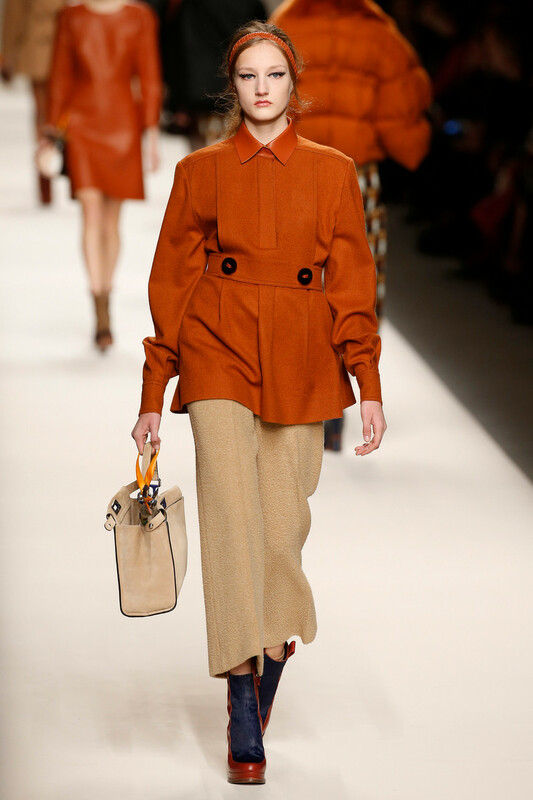 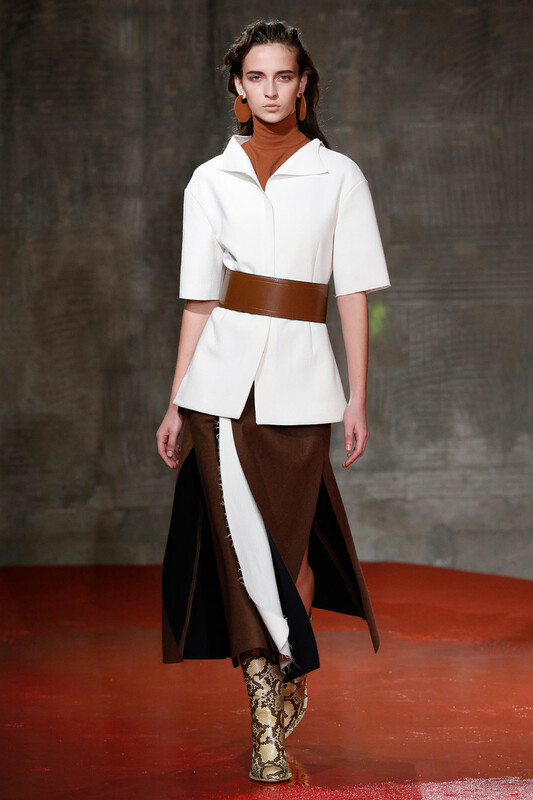 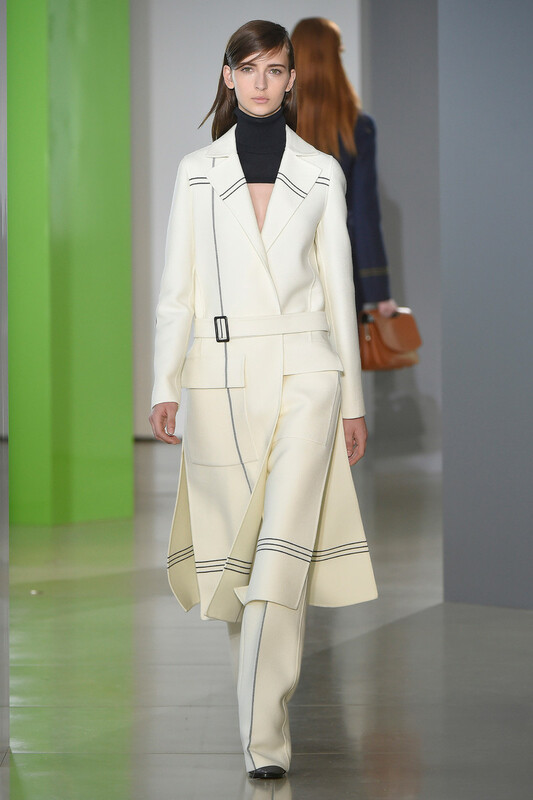 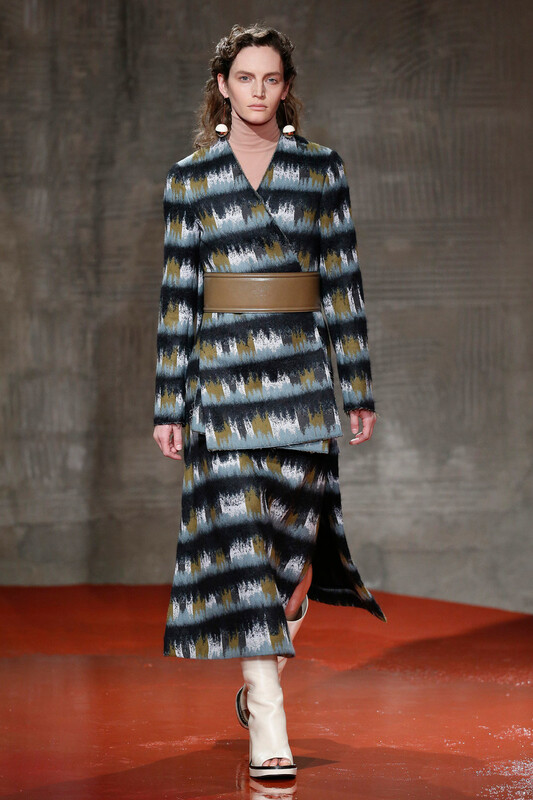 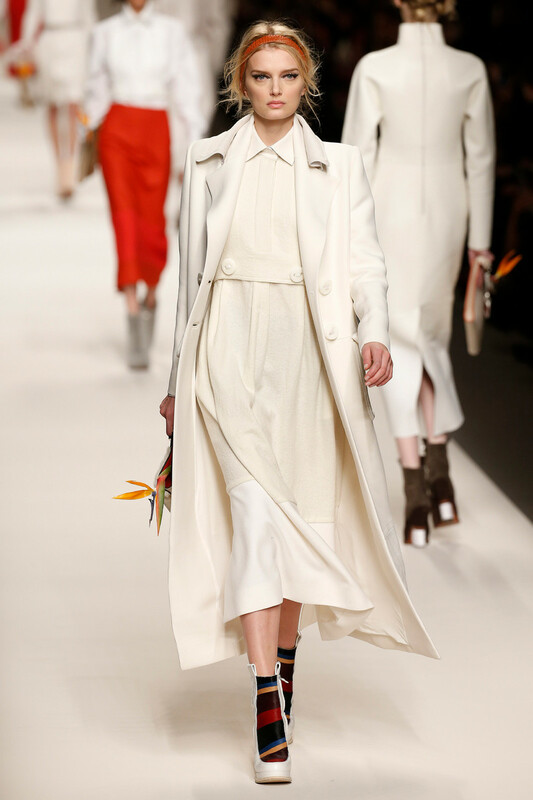 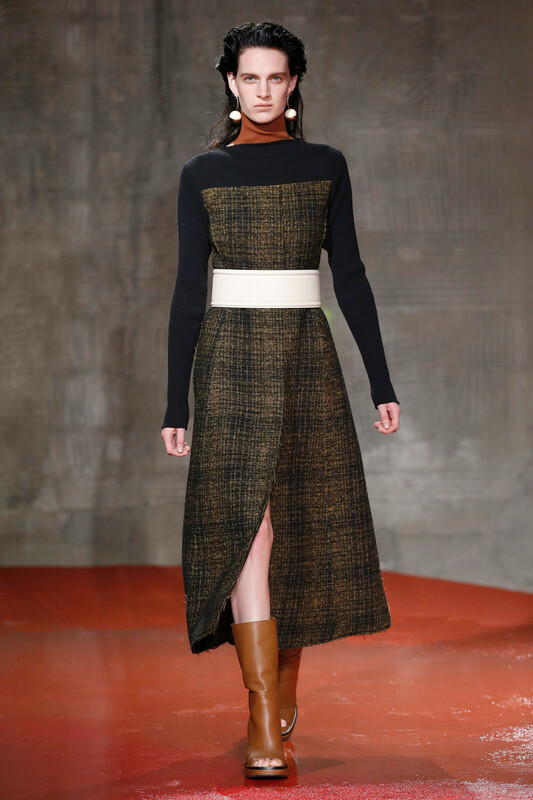 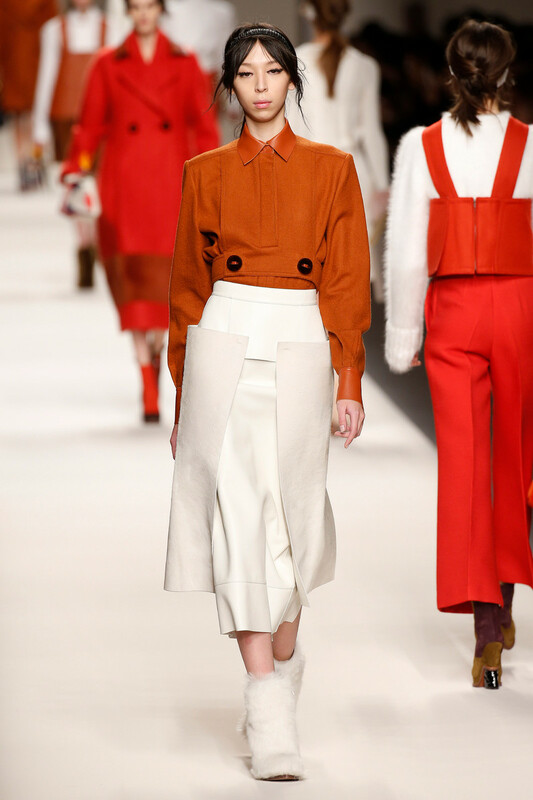 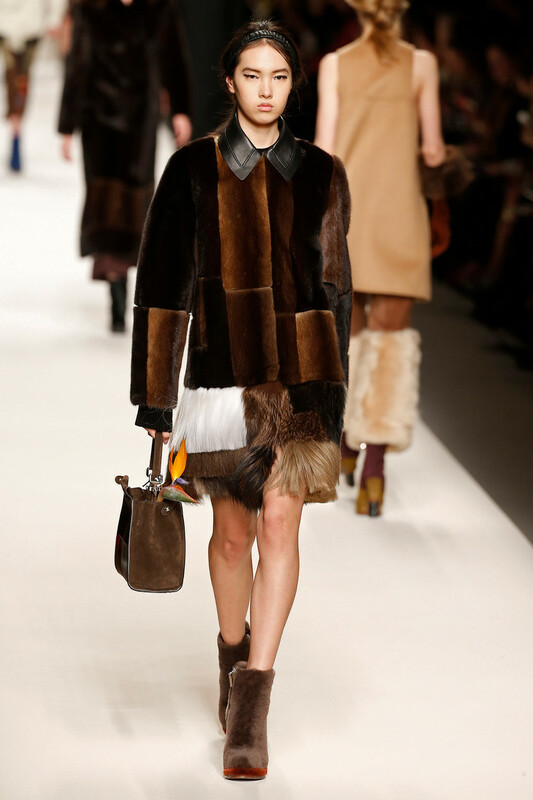 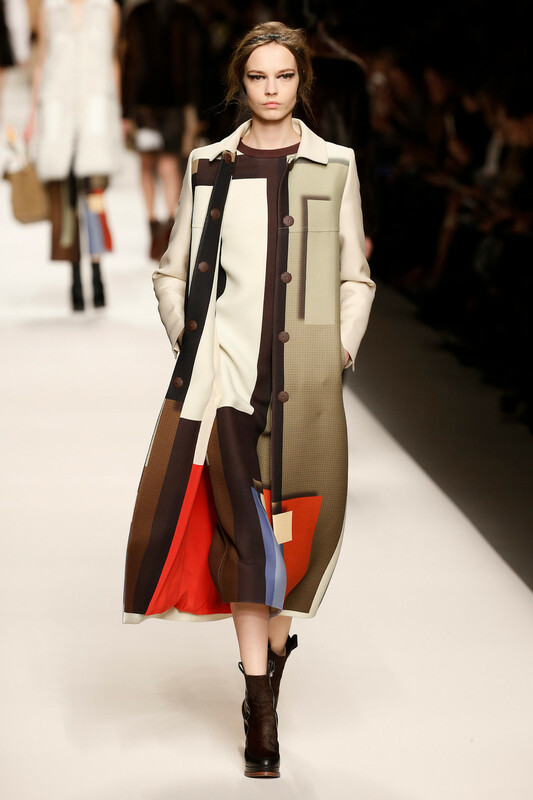 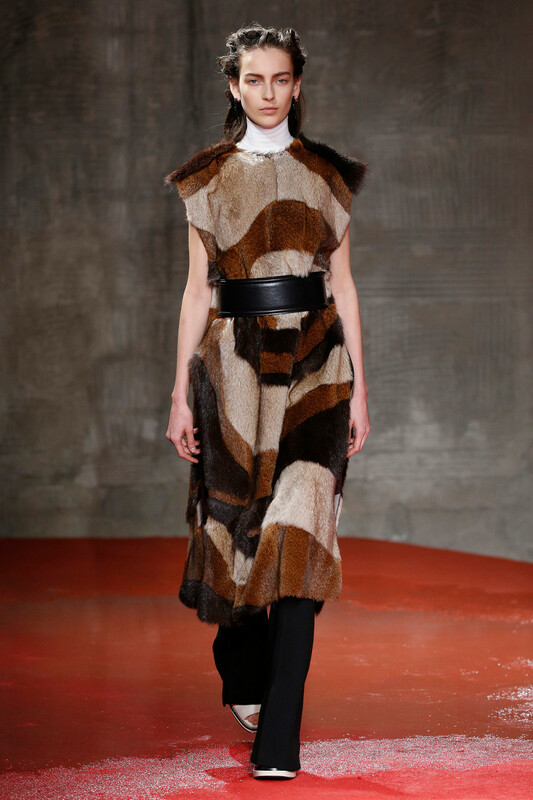 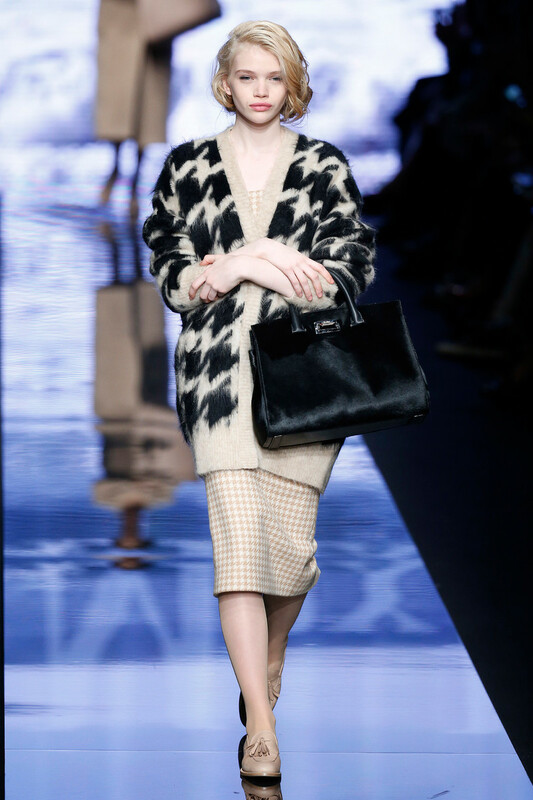 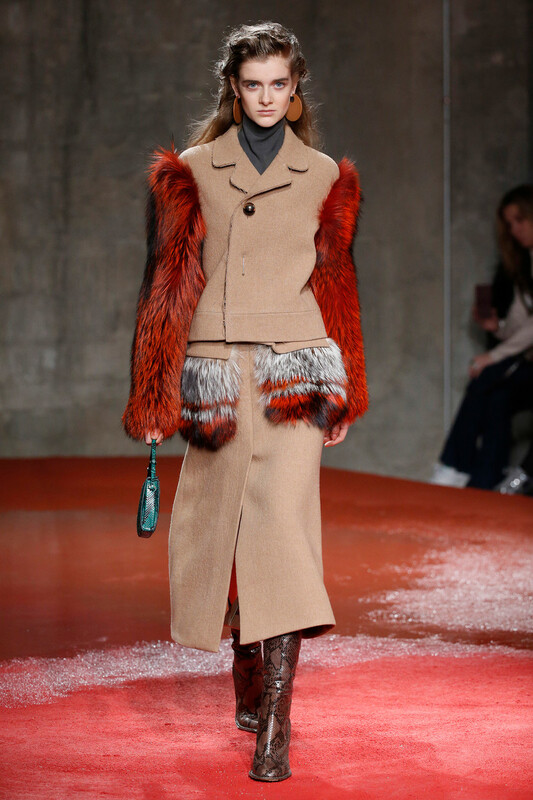 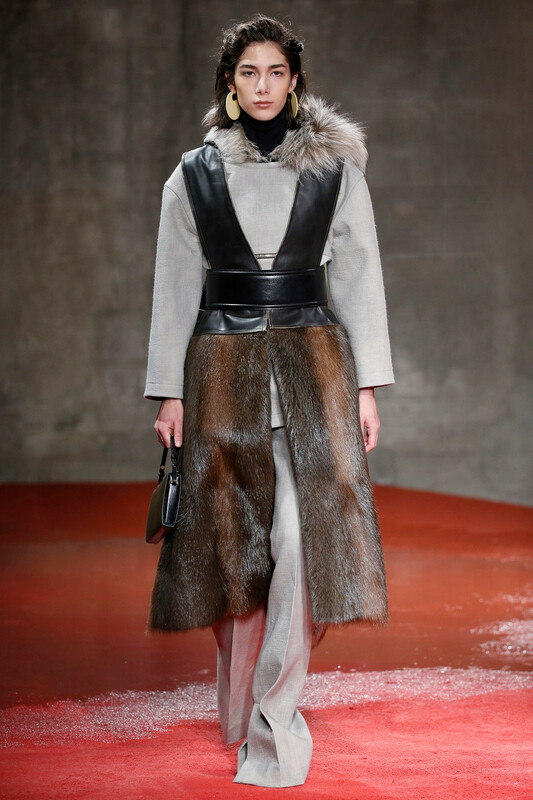 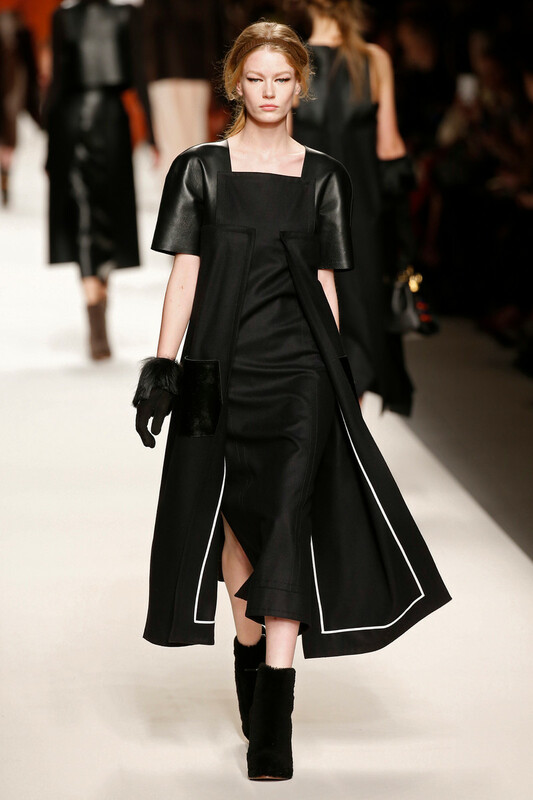 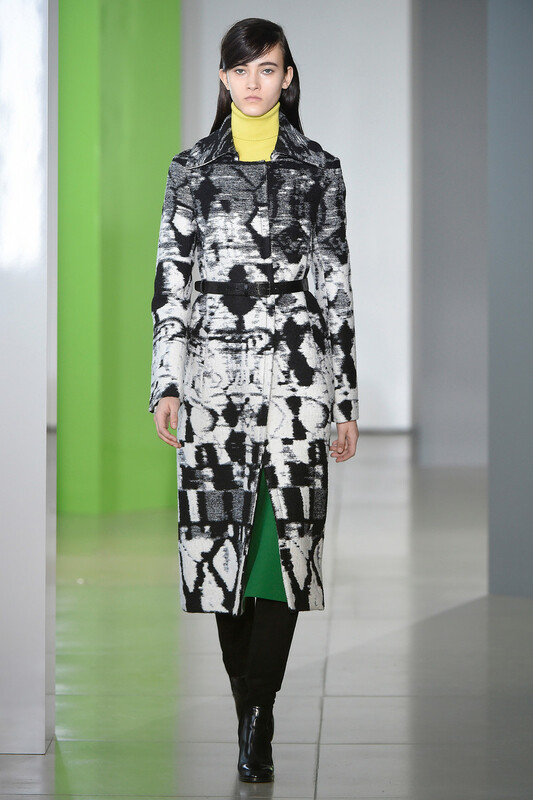 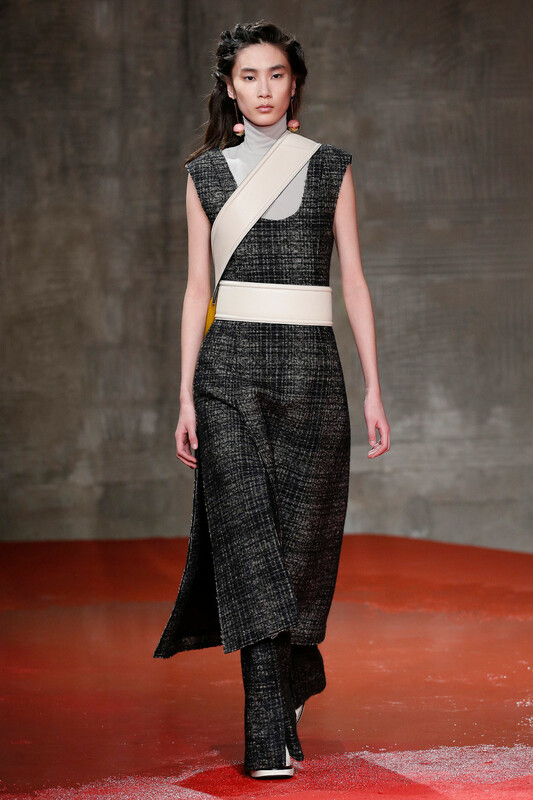 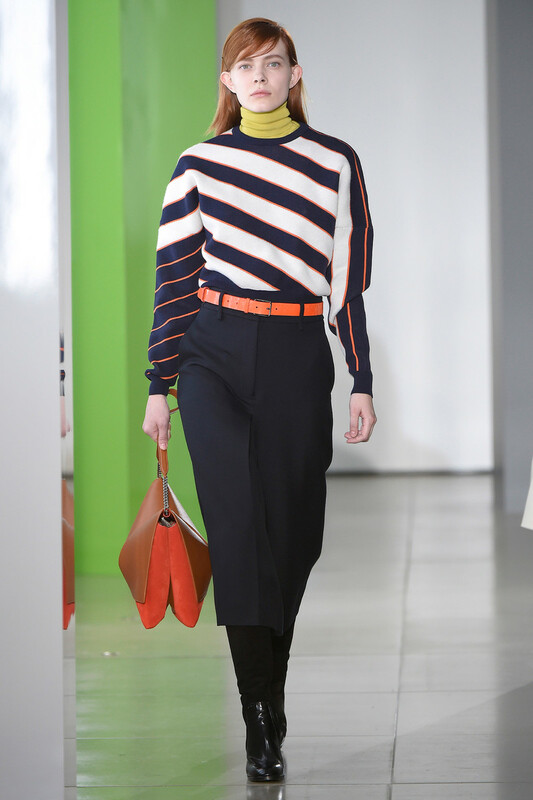 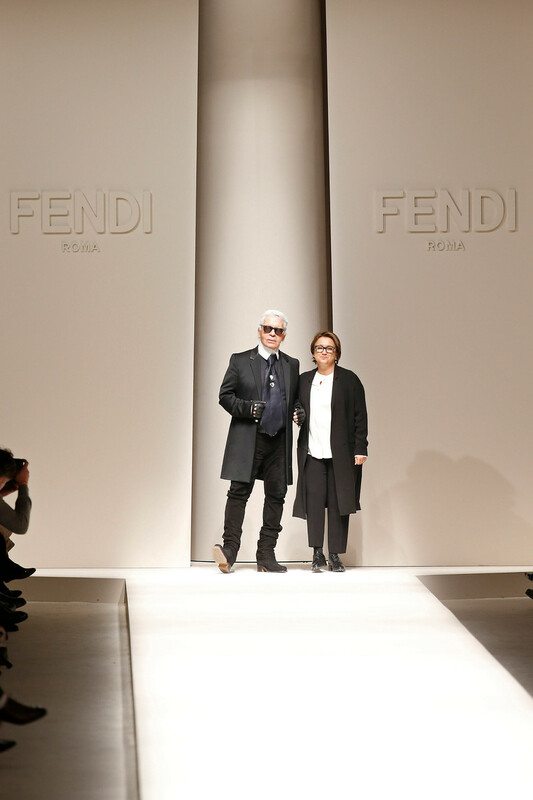 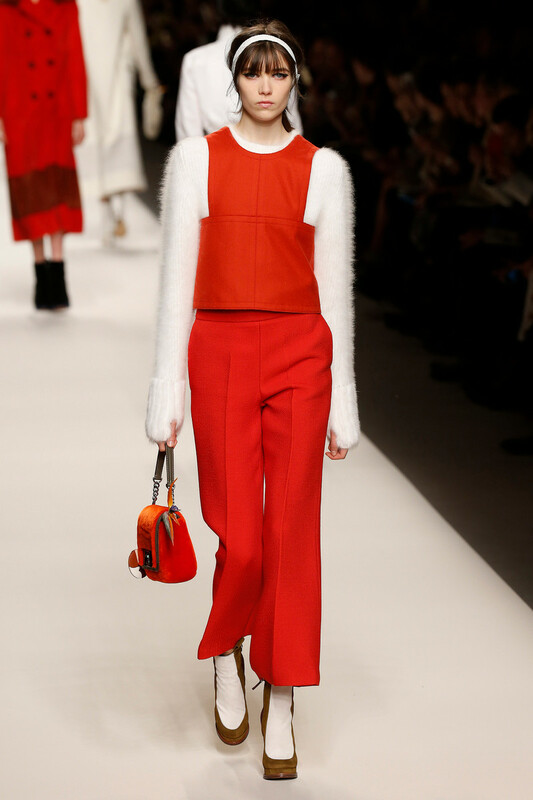 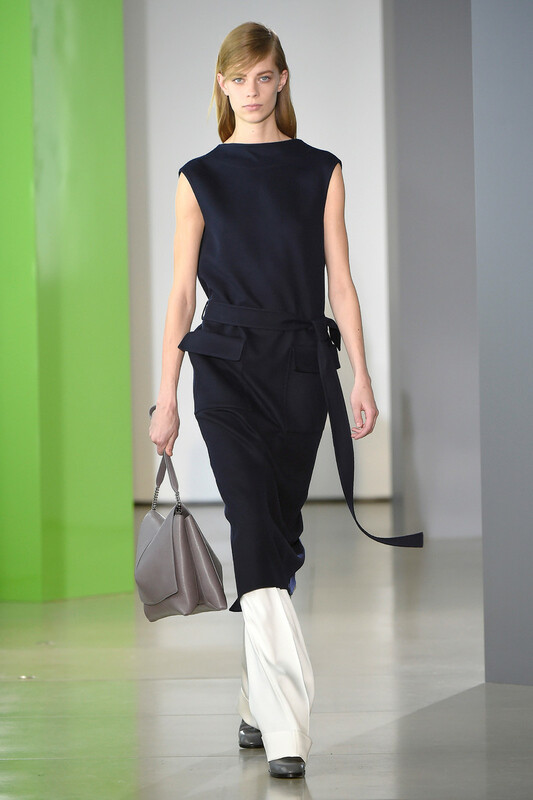 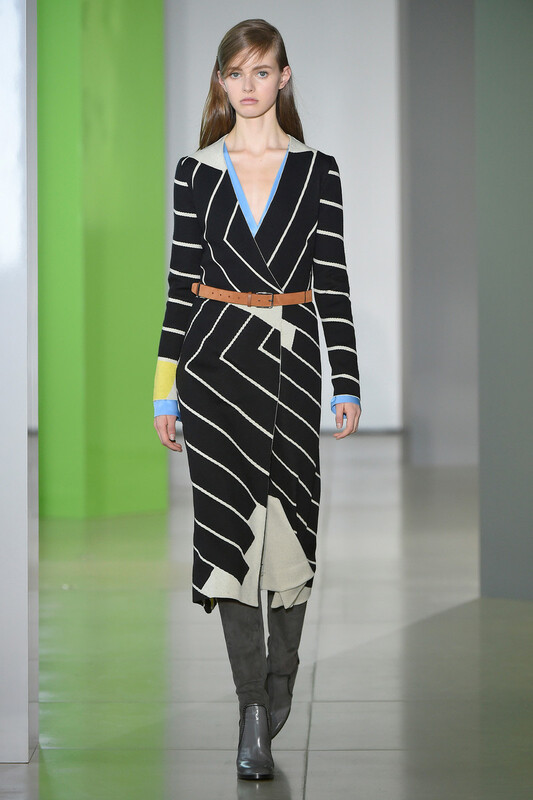 The Fendi-collection was all about geometry, experimental volumes and a little fun. 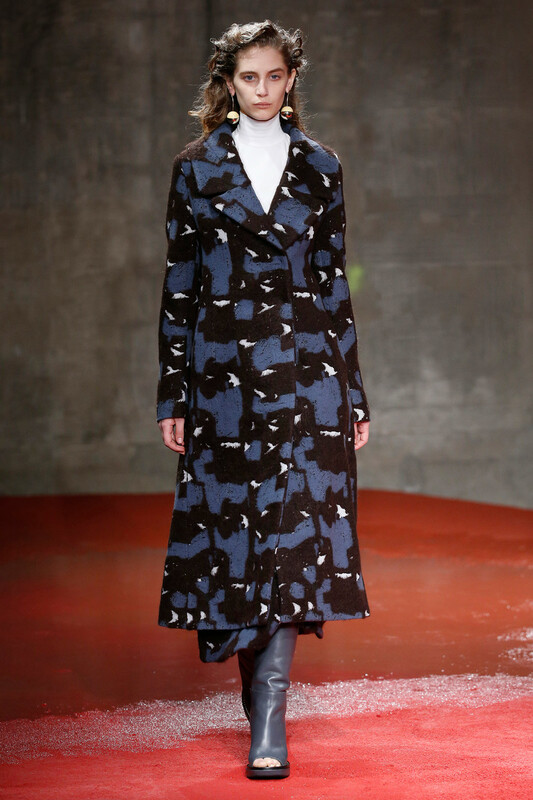 Inspiration for stage and invitation was the work by Swiss artist Sophie Taeuber-Arp. 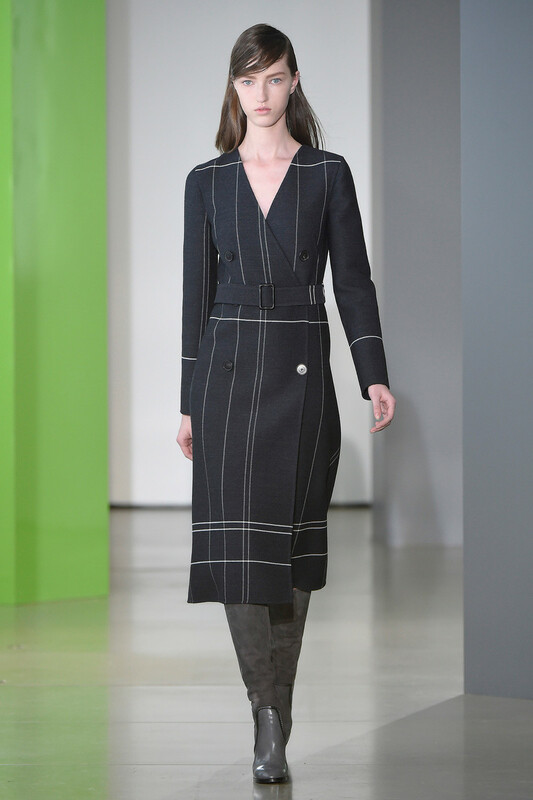 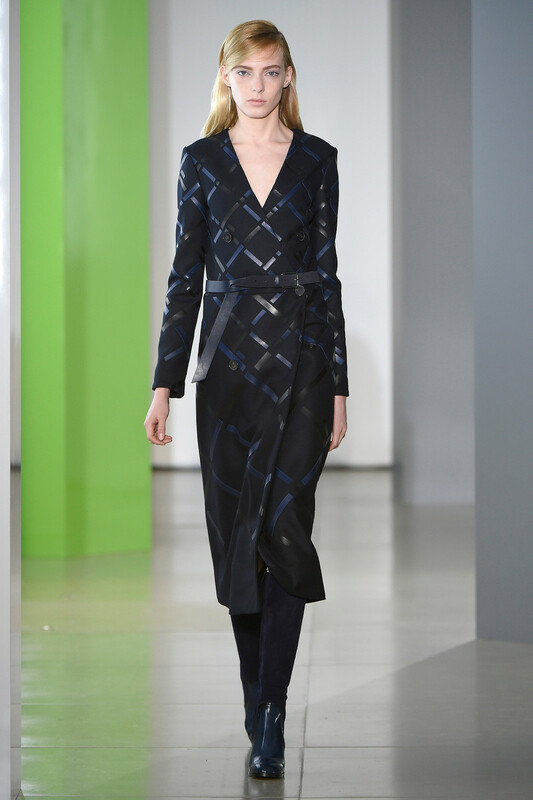 But while they referenced her circular work, much of what was on the runway was angular — coats, dresses, even pants were made from pieced-together panels. 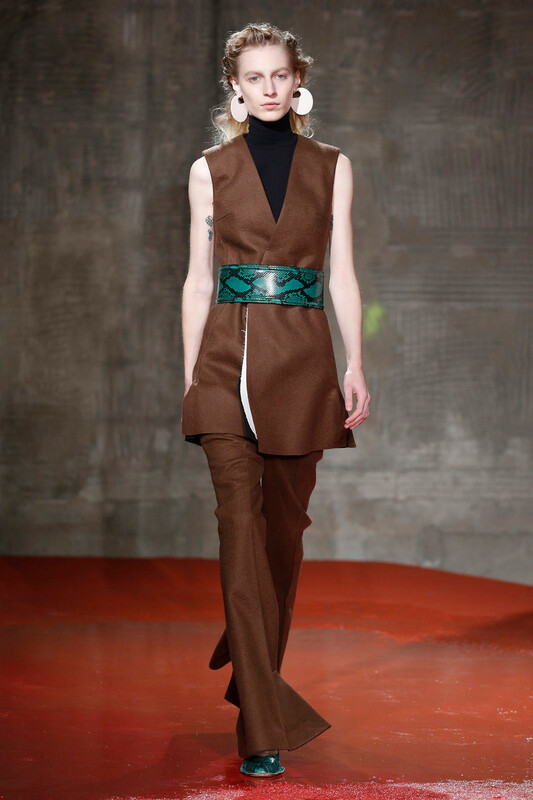 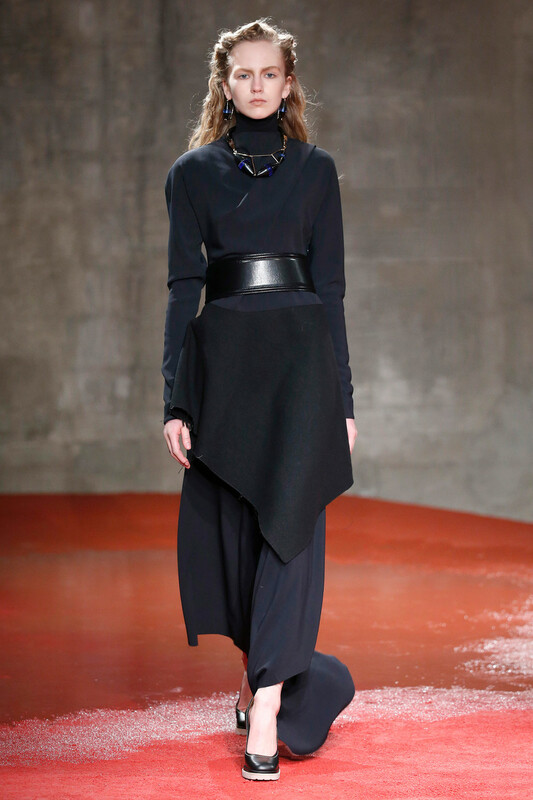 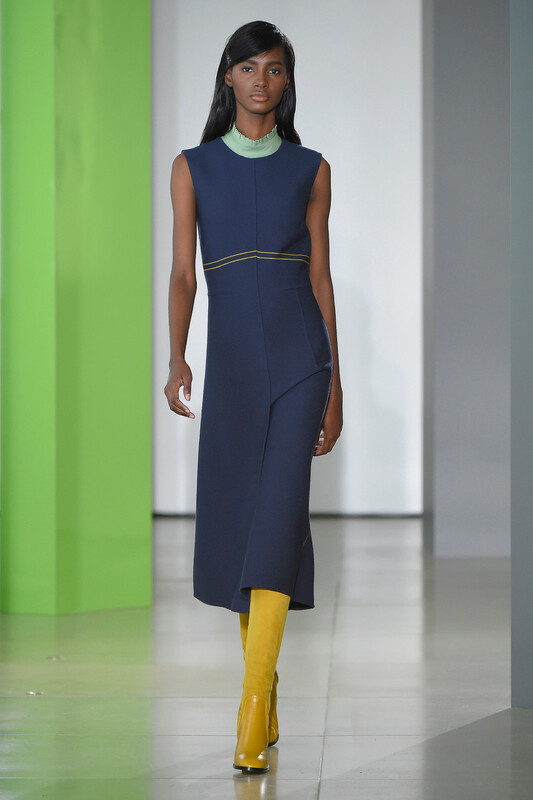 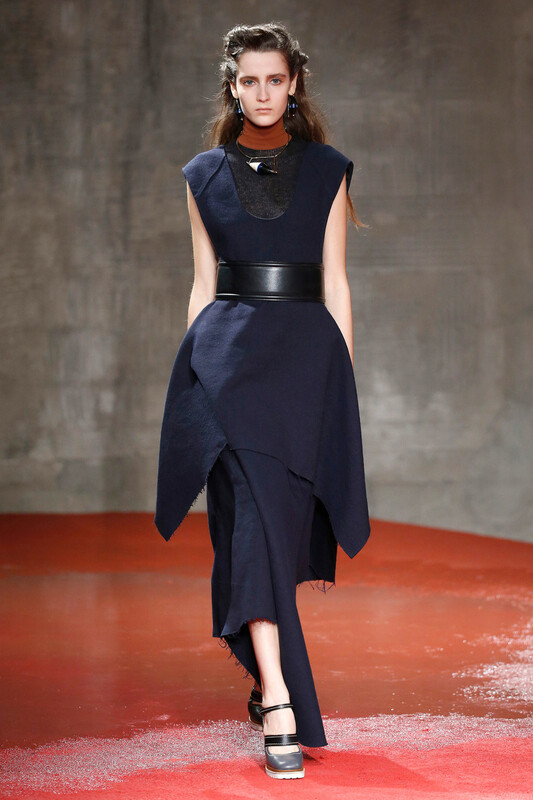 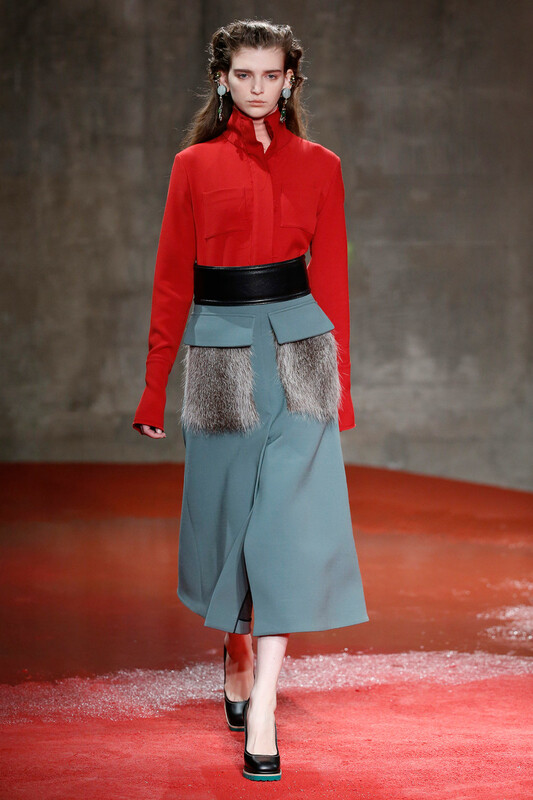 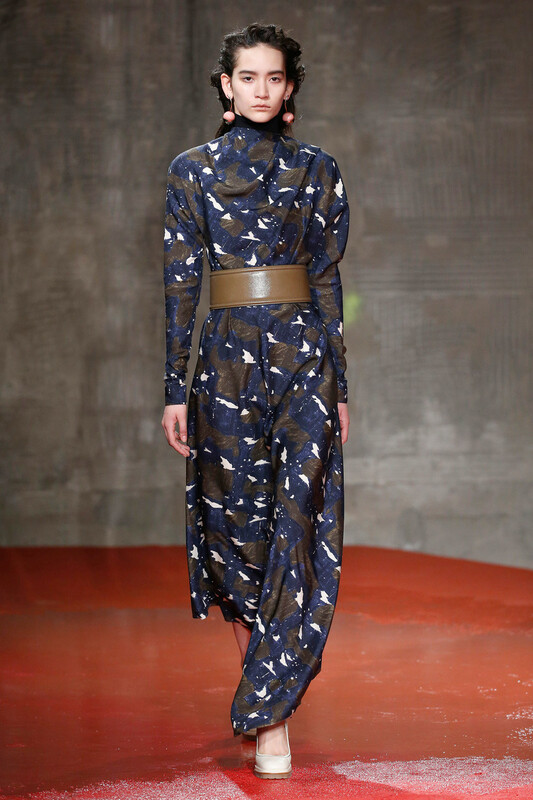 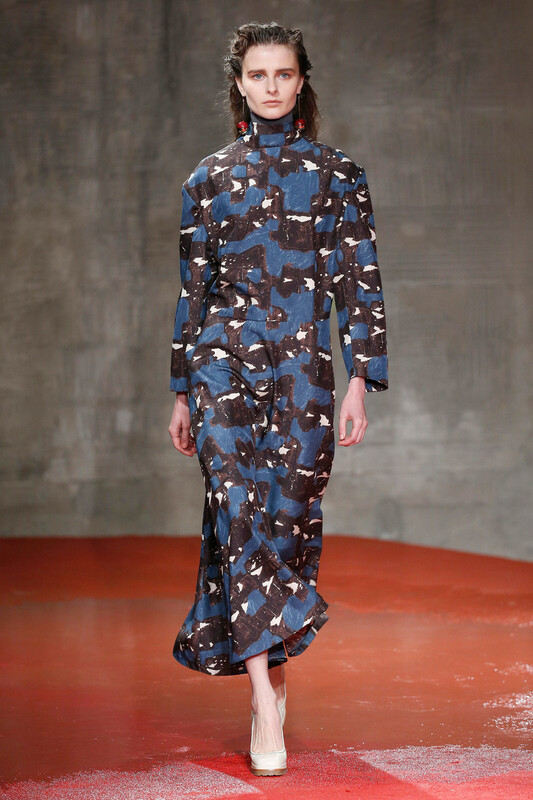 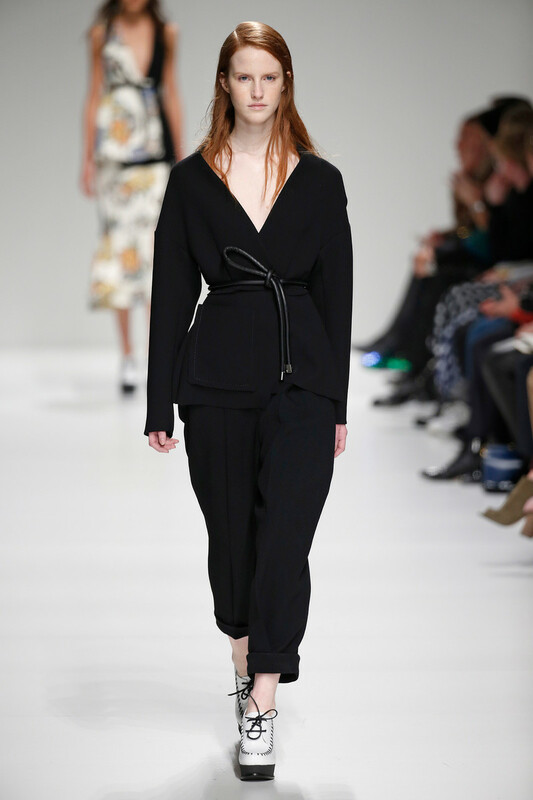 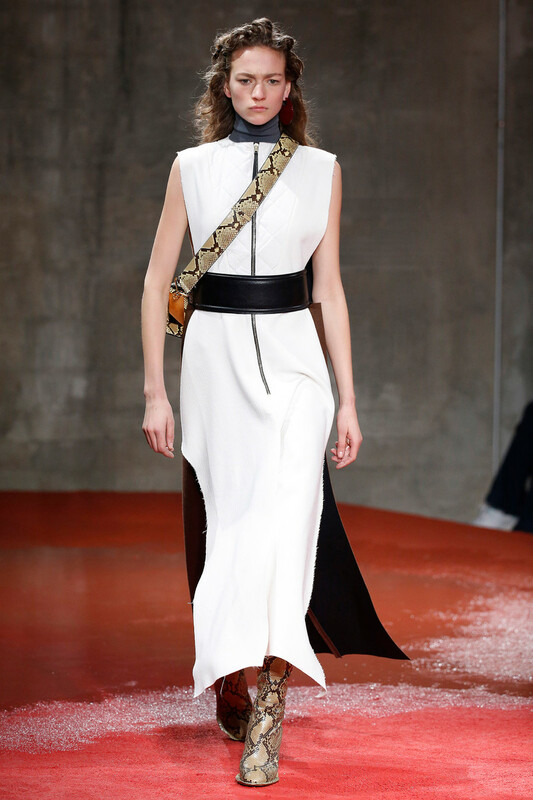 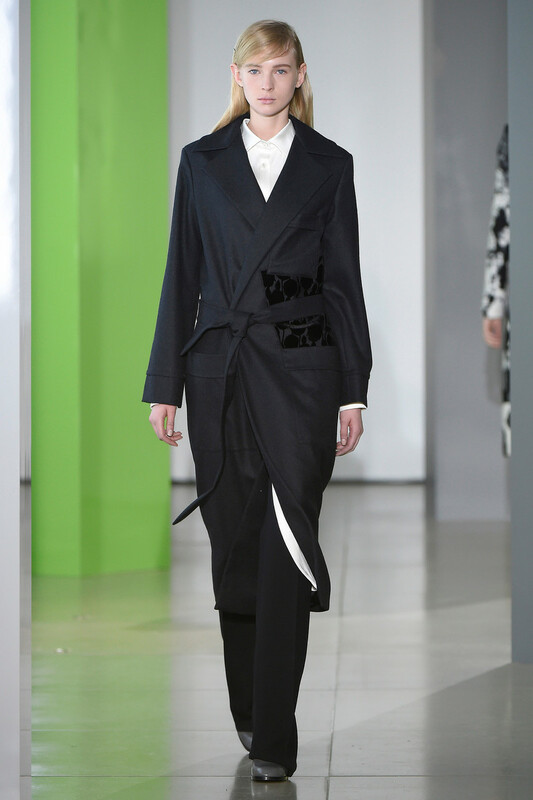 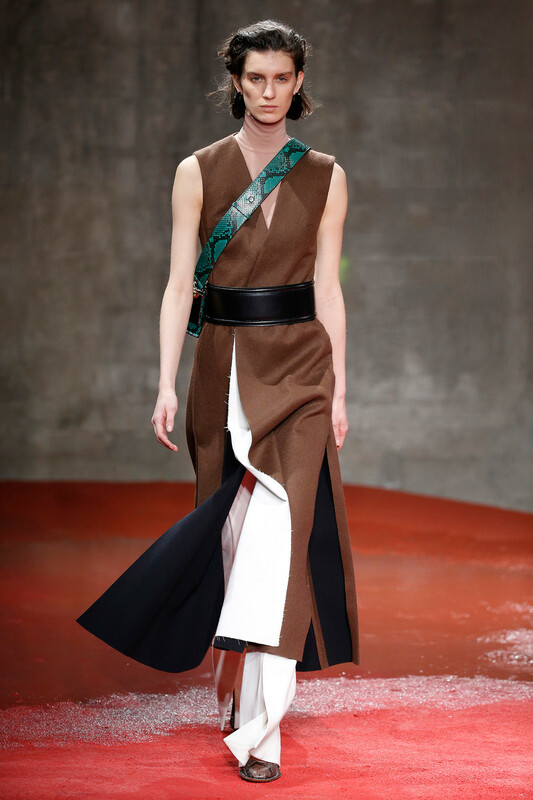 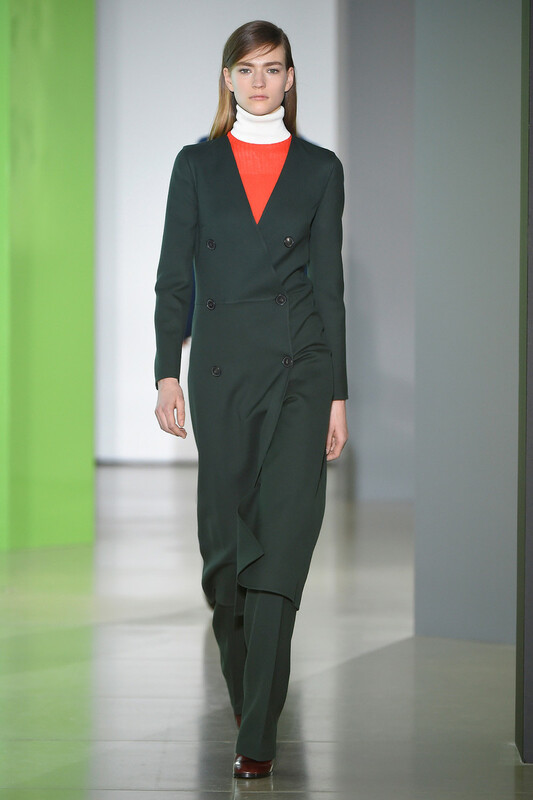 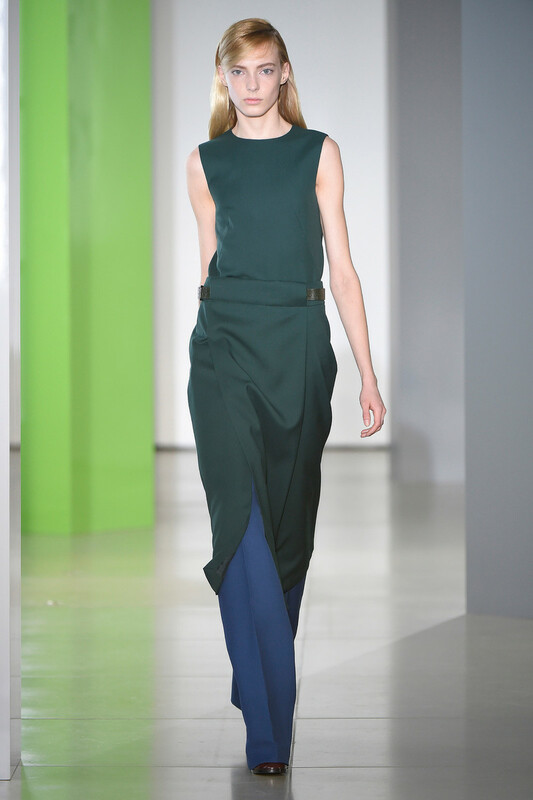 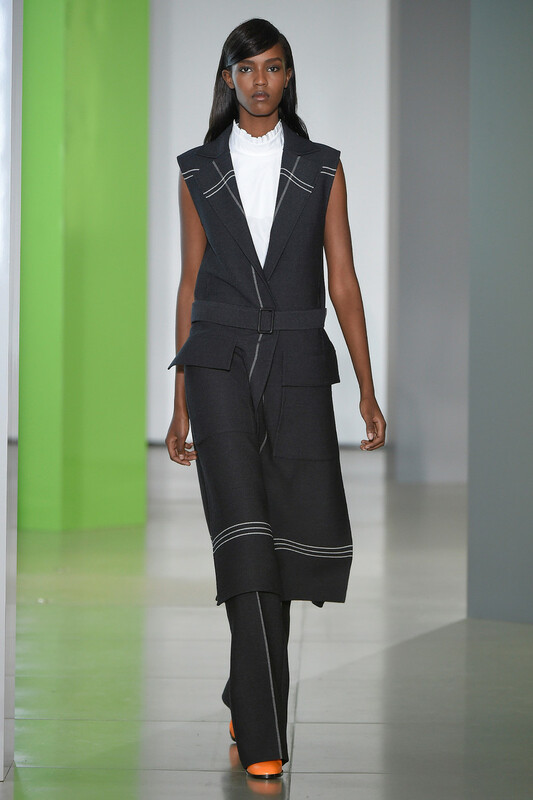 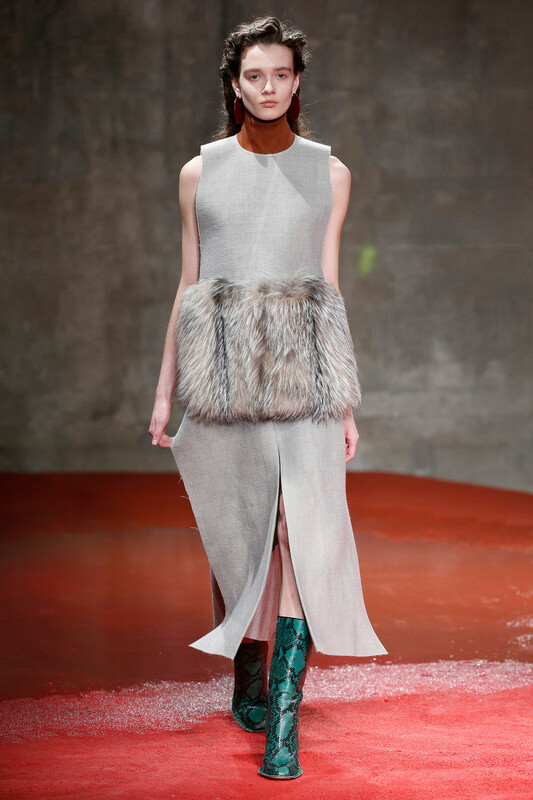 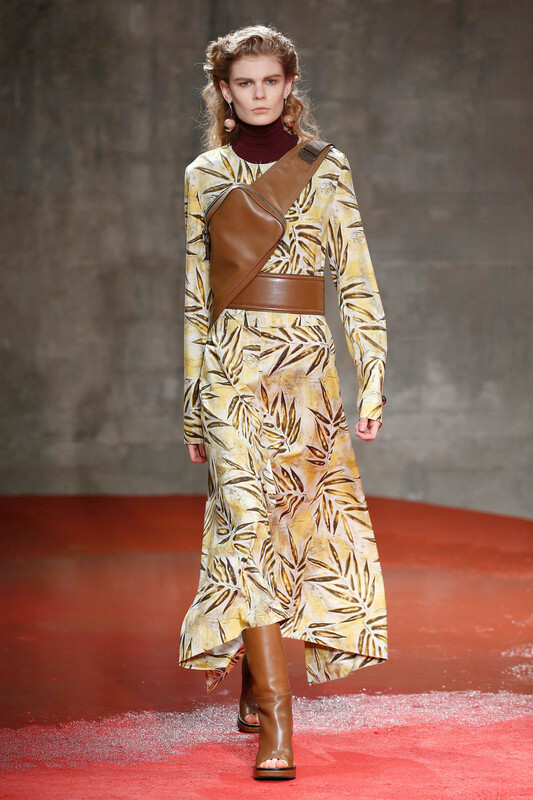 This collection was a fusion of faux-utilitarian pragmatism and flamboyance. 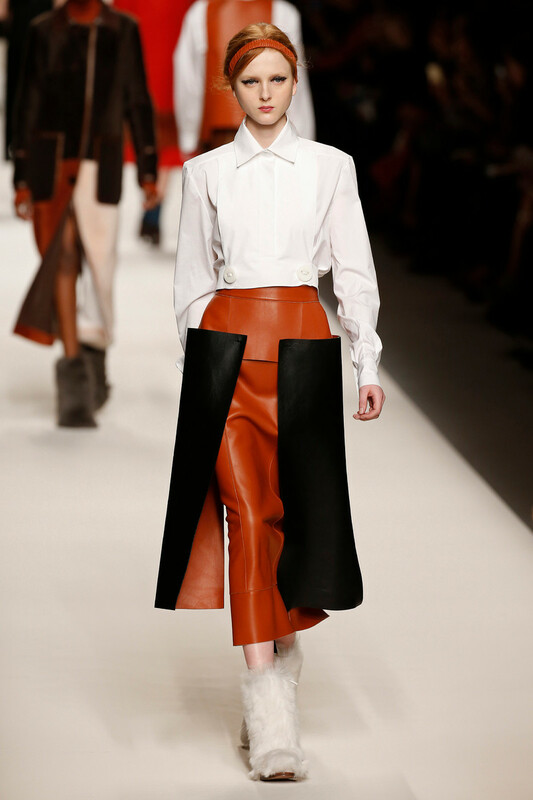 There was a bit of the Alpine worker to the pinafores and chaps-like leather additions attached at the hips to skirts. 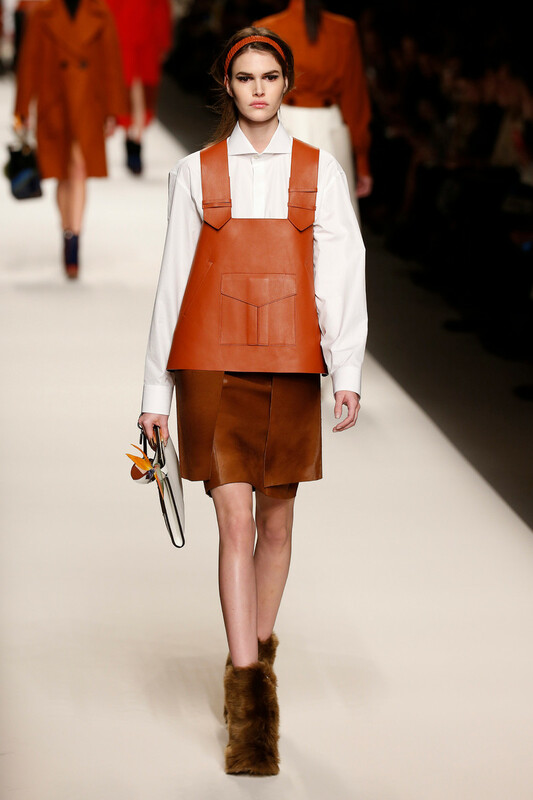 Bibs and aprons in paneled constructions were fastened by giant buttons. 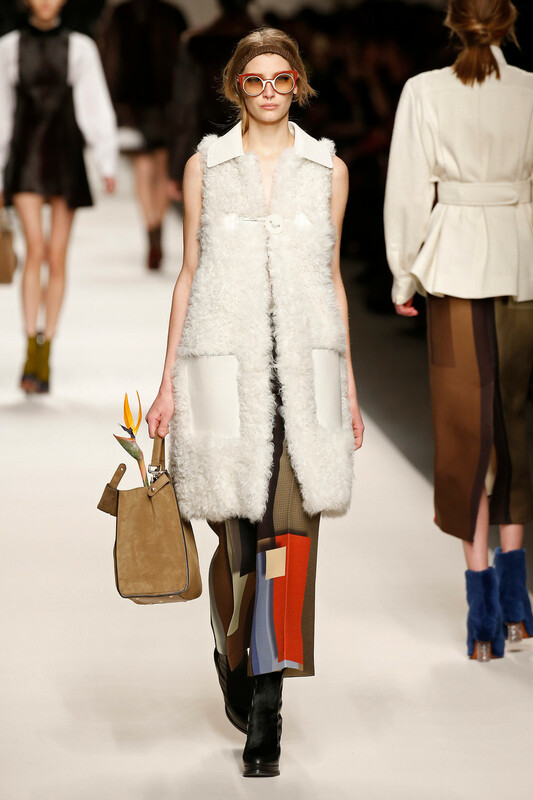 Continuing with the add-a-flower motif started two seasons back with orchid corsages, here, birds of paradise popped out of color-blocked fur and shearling bags. 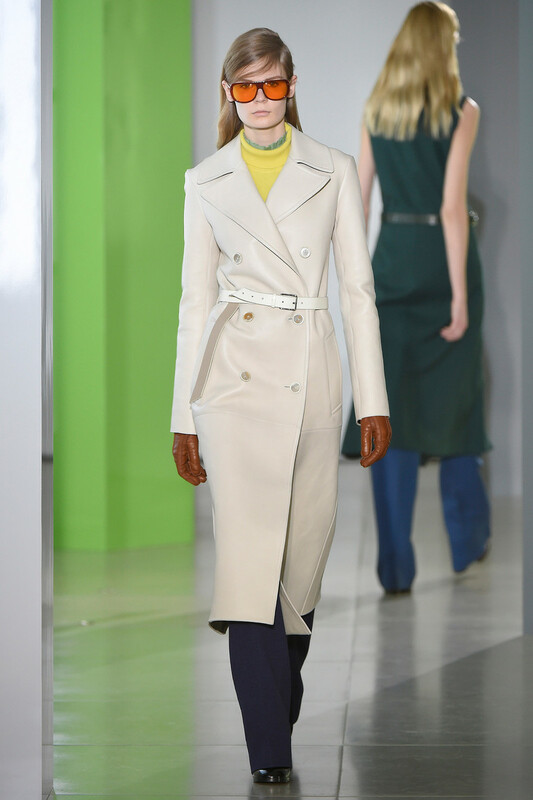 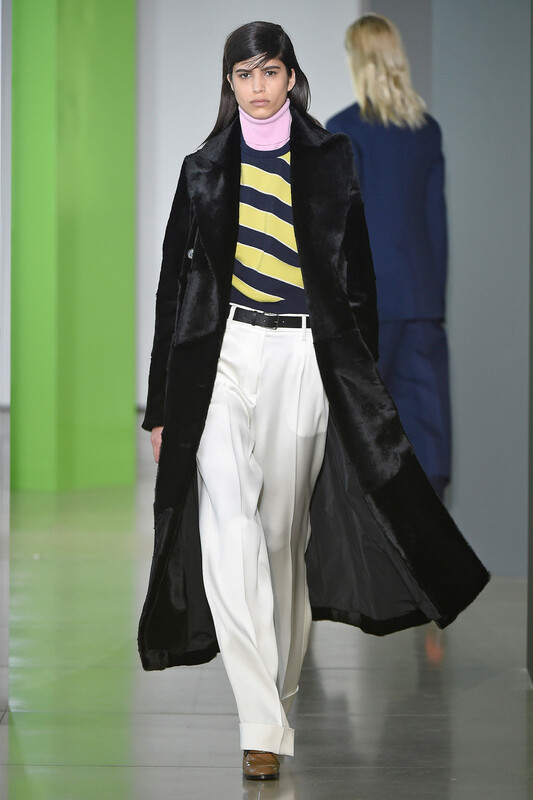 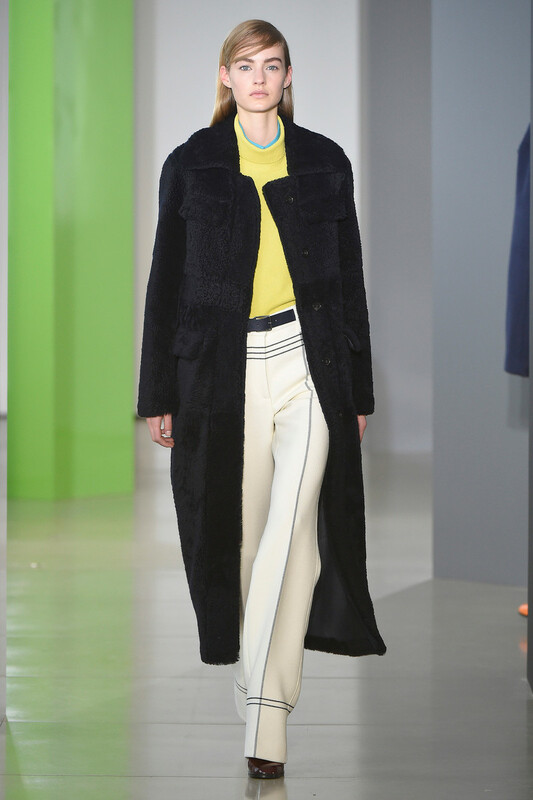 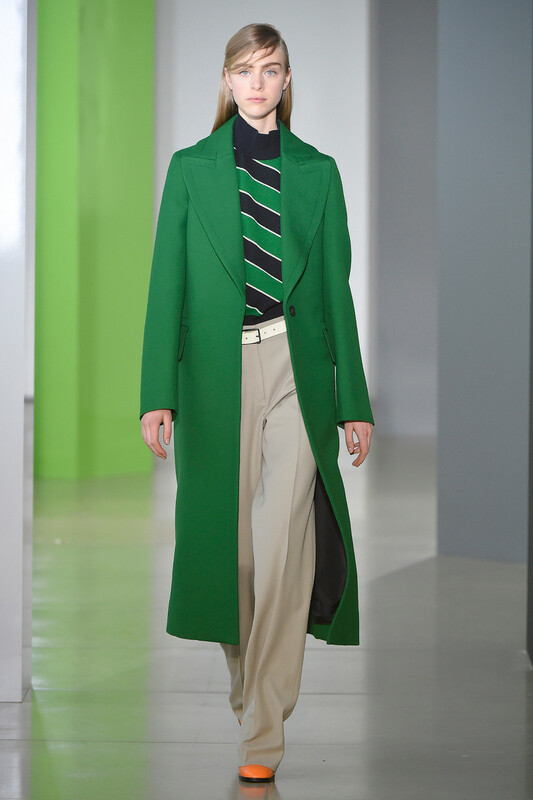 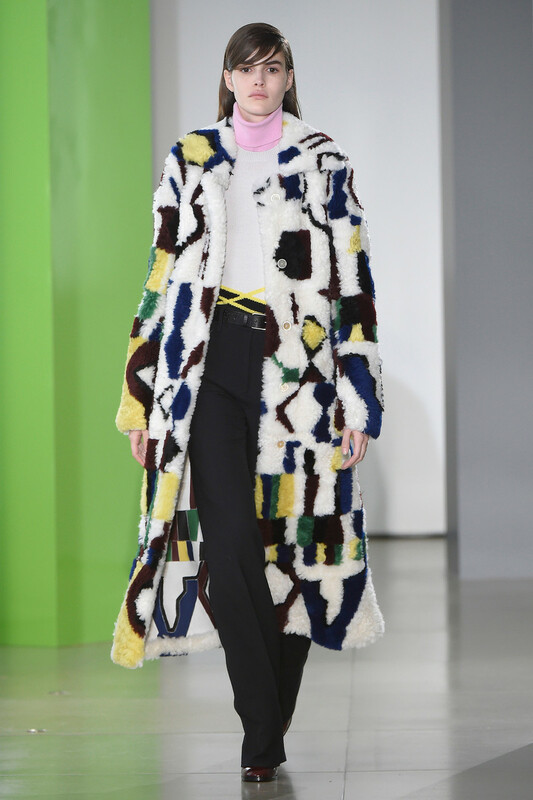 The fabric splicing intrigued — the simplicity of the two-tone white coat that opened the show to graphically collaged coats and a witty felt gilet over corduroy pants wrapped in tubes of shearling from the knees down. 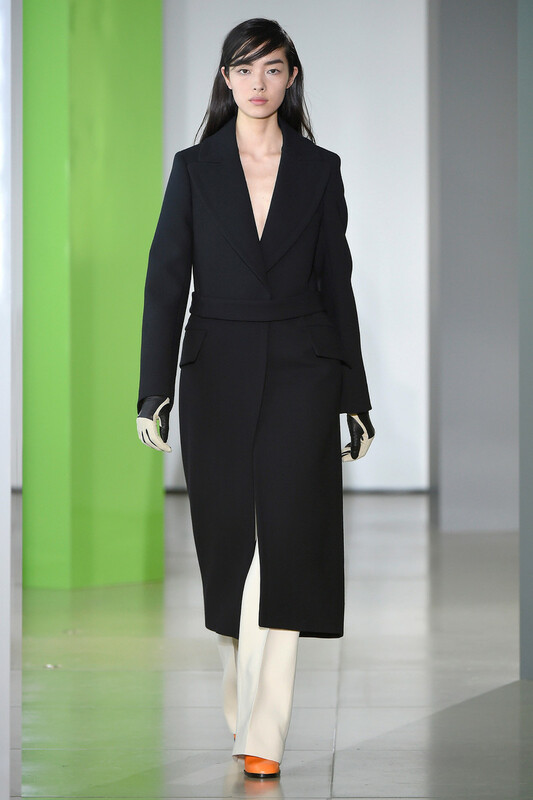 The diversity continued through to silhouettes; looks came long and lean, long and swingy, short and crisp, and big, bigger, biggest, with the mega-statement coming on the big side. 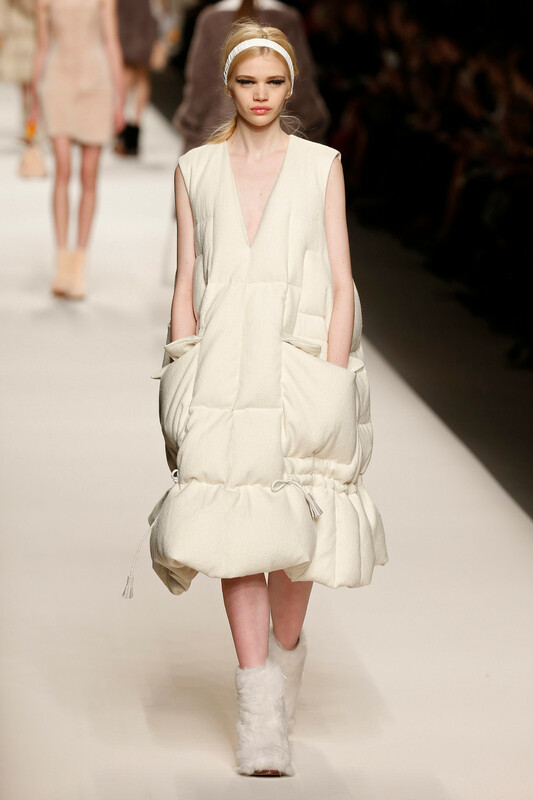 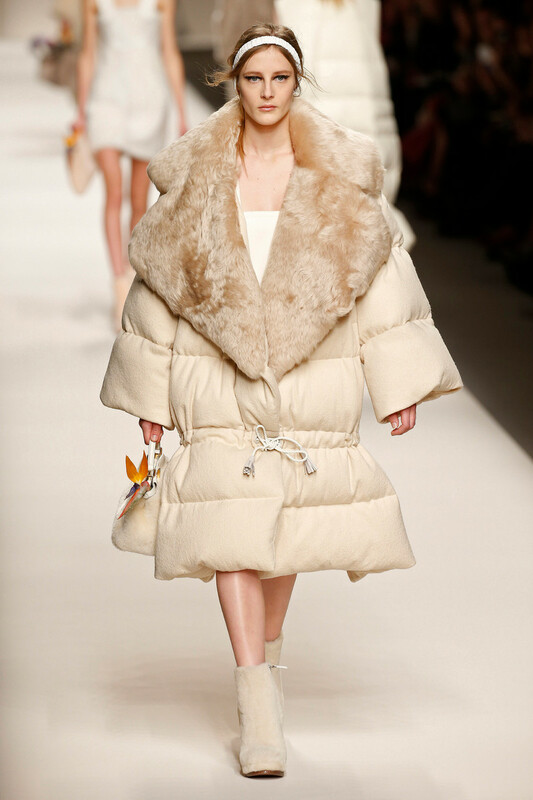 Lagerfeld and Fendi did outrageous takes on the puffer, including out-to-there short jackets over slim skirts and some strapless dresses.